This is our archive - a record of what we have been doing, with pictures and descriptions when we can get them! When the date of the event is passed, the Number Crunch entry on the front page is deleted and recorded here permanently, the latest at the top. 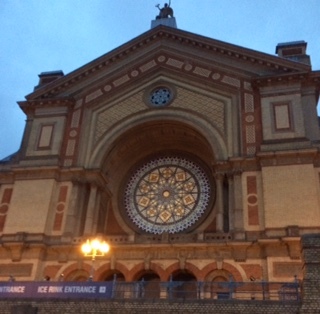 Lovely to be able to attend Alexandra Palace October 2018. 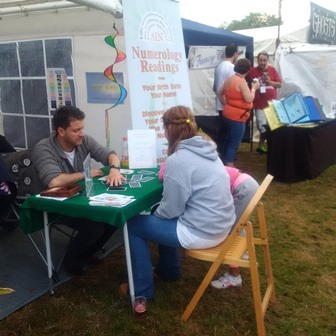 Another great weekend focusing on Numbers, via readings, written and verbal communication with such amazing people visiting us at Stand 174. That lovely 12/3 intrigues me, work carried out in the quiet depths with awareness, and I am sure achieves great results. 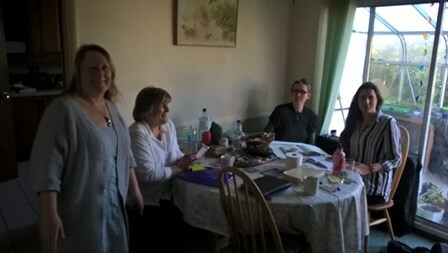 Lots of activity from the group, Readings, Talk, Spreading the word on Numbers, the delightful digits of light, and the journey they take though and within us as we navigate life. 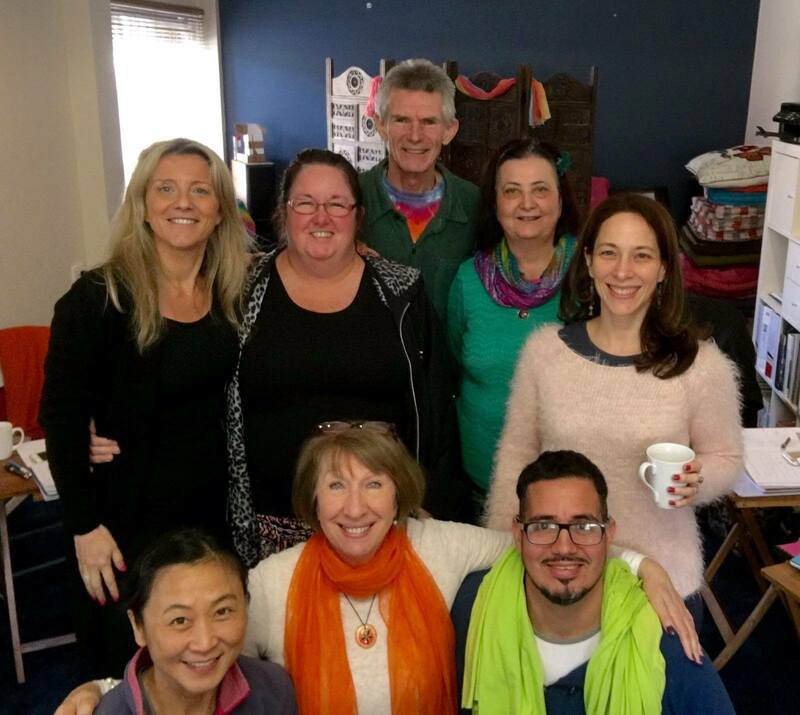 Thanks to: Berenice, Christoff, Gill, Gaynor, Hilary, Jane, Jax, Margarita, Mariela, Sonia. 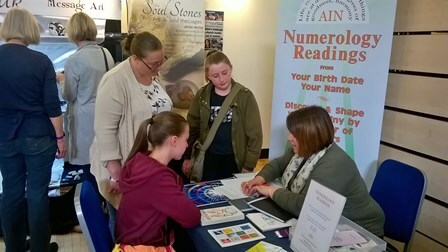 We gave talk, carried cases, created our stand, gave readings, answered questions, provided information, promoted Connaissance School Courses. Activity and friendship coming together for a successful weekend. 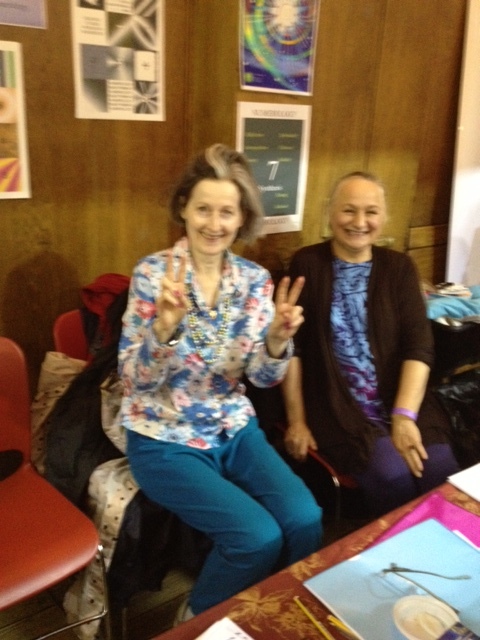 Thanks to Jenny Myers and her friend for giving readings and supporting the stand Friday 19th. Sonia gave a talk to about 20 people with about 10 more stood around and some of those people went straight to the stand for readings. 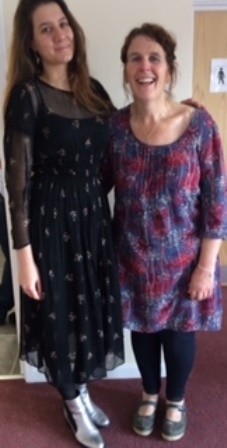 Gaynor did an amazing job of coordinating. 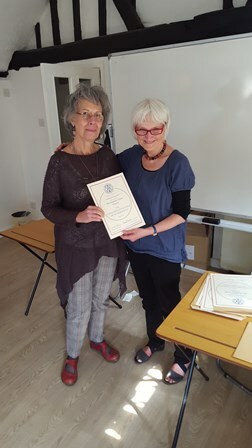 "The Associations’ 25th AGM took place on the 22nd of September at the Coombes Community Centre – the same venue as last year. We gave out the new AIN product, a lovely deep blue cotton tote bag with the logo from the brochure on it- a theme which was followed up on the icing of the cake. 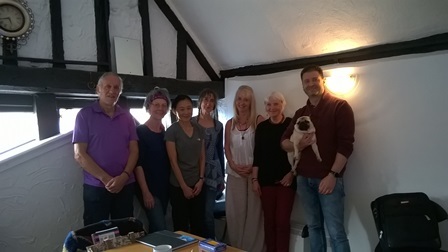 After the chair gave a warm welcome to all the members, apologies were given from several of our council members, namely Christine Tonks, Mariela Fronza and Arthur Tomlinson, who, though unable to attend, sent best wishes for the day. 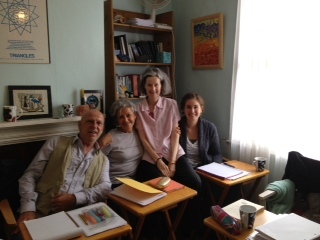 We were delighted to have Cristiana Caria, our Connaissance School teacher from Italy, with us. Then the activities of AIN’s year were summarised in the reports. In the Chair’s report it was noted what an intense, busy and extraordinary year it has been, with many ups and downs. A lot of movement and much has been achieved by AIN through holding the love of the greater vision. 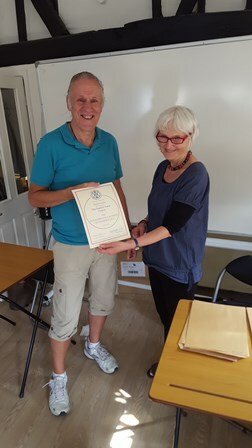 Thanks were given to the work of Nick Aegerter, who looks after the website and produces so many documents for AIN and the Connaissance School, and of course to Claudine, Founder of both AIN and the School. An appreciation of the grief and loss that has been experienced this year was also noted. 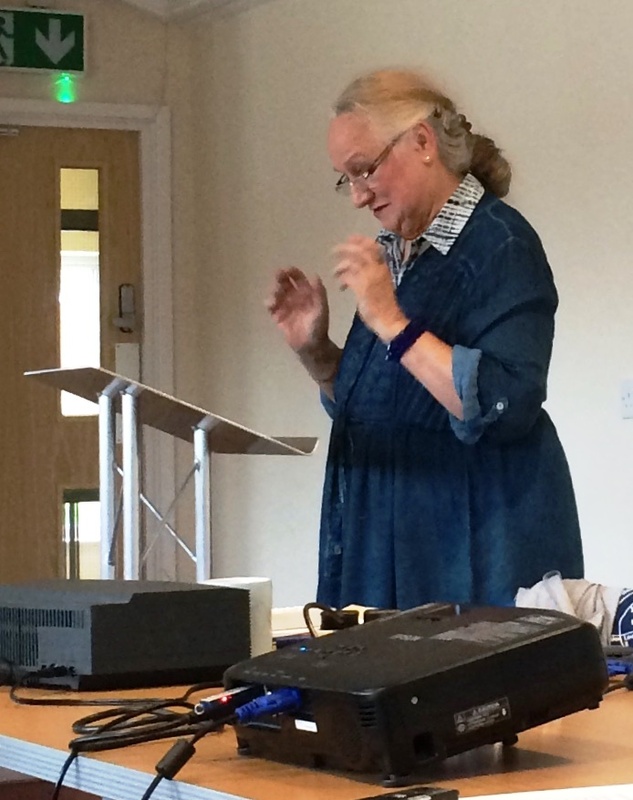 Our secretary and treasurer Gill gave our yearly report on AIN membership and finances. 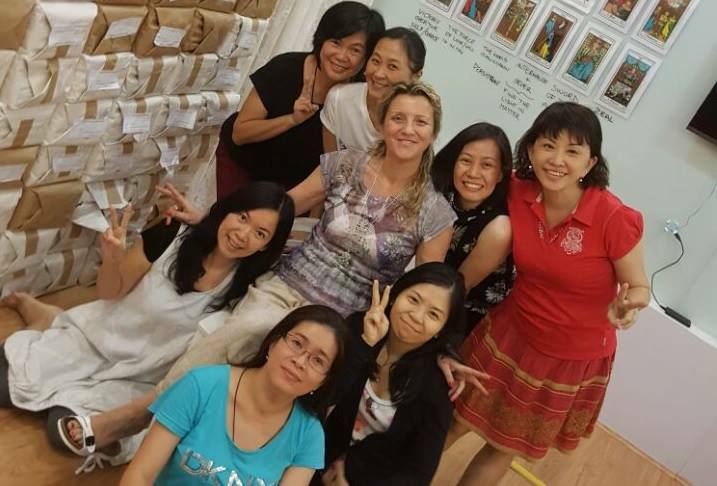 Claudine gave a report from the Connaissance School, which as always continues to expand all over the world. 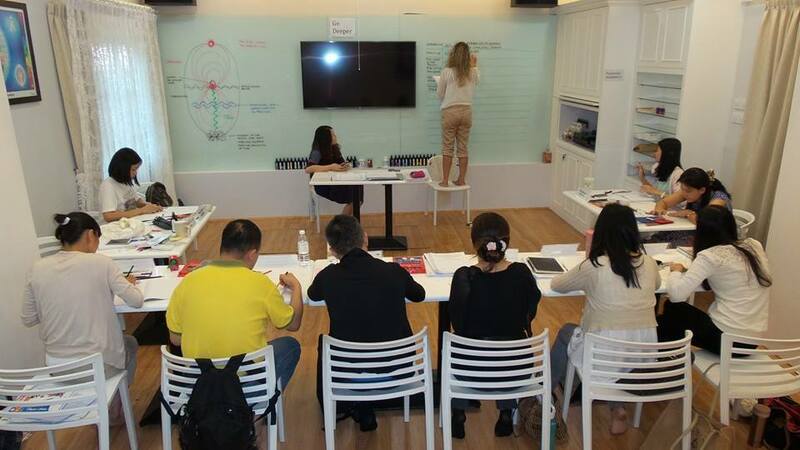 New possibilities are opening up in countries such as Mexico, India and Russia, as well as more expansion in the countries we have already run courses in. 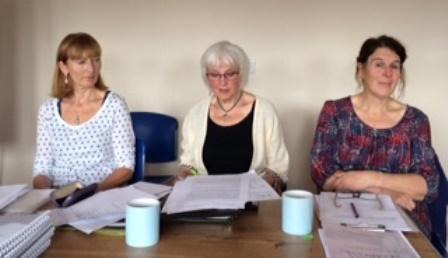 The events report was given by Gaynor, who has agreed to stand in for our events officer Christine. She listed the many fairs all over the country that have been attended by AIN and our members. 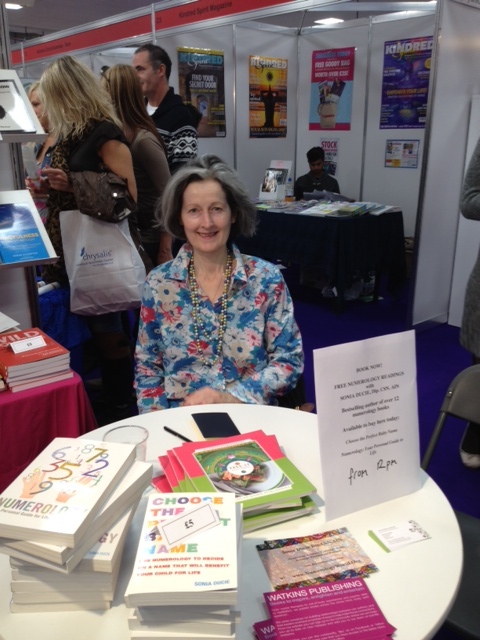 Also AIN will be taking part for the third time in the big forthcoming fair in London, at Alexandra Palace, London in October." 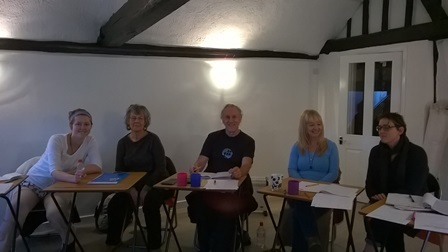 Masters Modules 1 , 2 and 3 11-14 & 18-19 September 2018 The Cave Shop, 8 Melbourn Street, Royston SG8 7BZ. 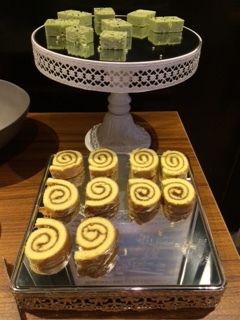 - at a hotel conference centre in Chaoyang - was superb. 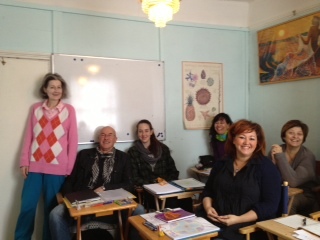 There were 12 new students and 4 students resitting. 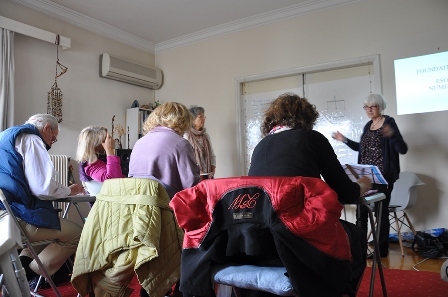 It was touching to see how the 'old' students came forth with wisdom about how much they had learned and that some of their fundamental patterns had changed since their last course/s. One lady exclaimed how all her problems - that were around for ages - had simply dissappeared in the last two days of the course. She was astonished and so happy. 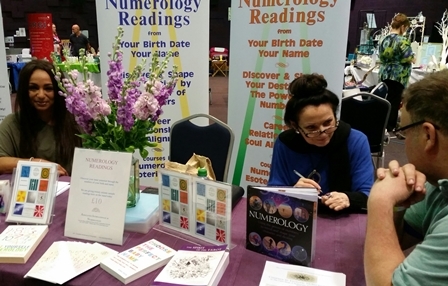 She said, 'I love Numerology.' This group really bonded (4 - viability) and it all came together like a dream. 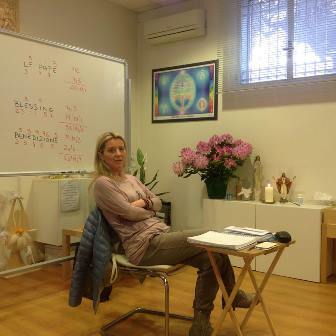 Foundation Course in Esoteric Numerology Athens, Greece. 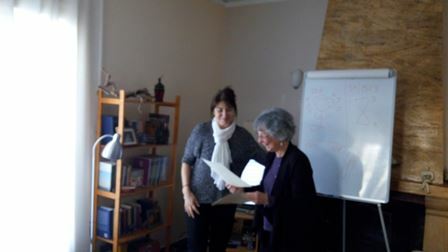 Teacher : Christina Kosmadaki Saturday 10th & Sunday 11th February Saturday 24th & Sunday 25th February Future days to be arranged More information: www.numerologyworld.org/courses. 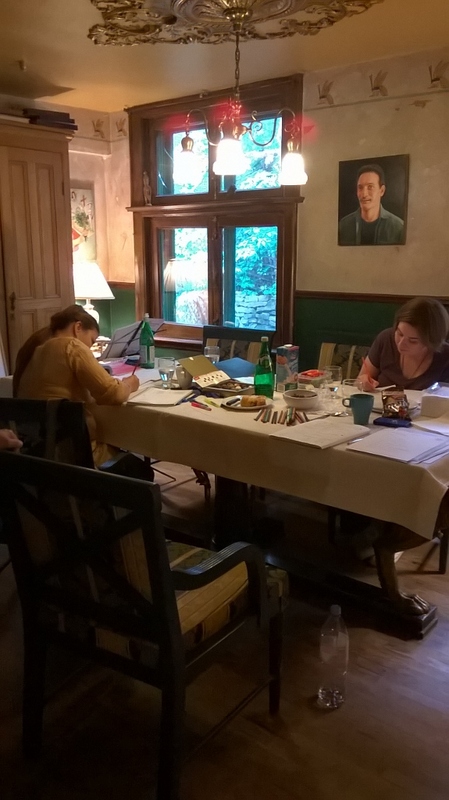 Report and pictures from Christina: "The Foundation Course has been successfuly completed and it is hoped that out of success, succession will follow - maybe the next one will take place in June. It was a real joy and an inspiration - a very good team!" 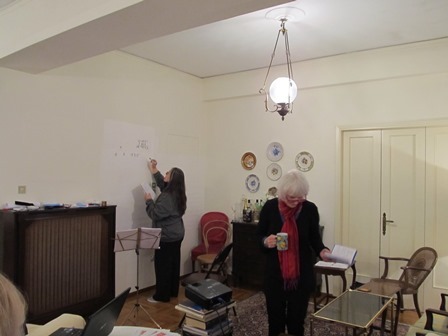 January 2018 Foundation Course in Esoteric Numerology Mexico City Mexico. 23 to 28th January. 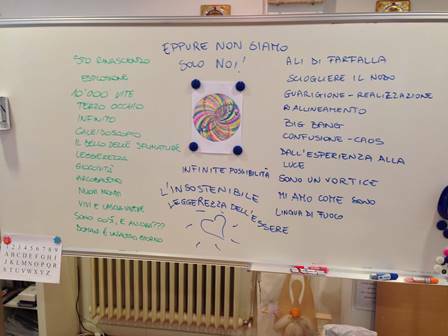 Teacher: Cristiana Caria. 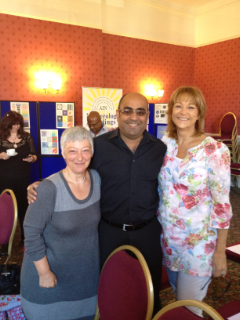 "A very successful event! 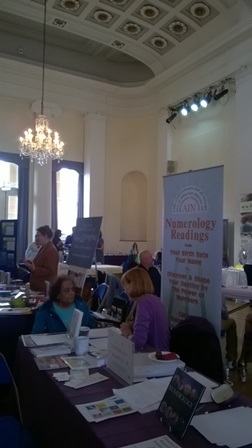 Alexandra Palace in north London was a lovely setting for the Mind Body Soul 3 day event and our second visit to this venue. 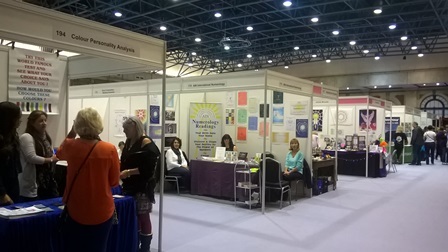 AIN had a very well presented stand, with all the Numbers out in force and also a poster of Pythagoras to inspire us as we worked! It was quite busy in terms of the number of people attending the event. 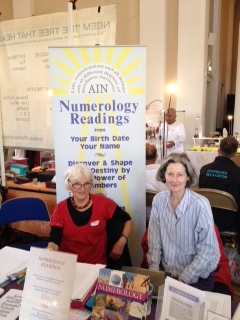 We gave around 50 readings over the weekend. 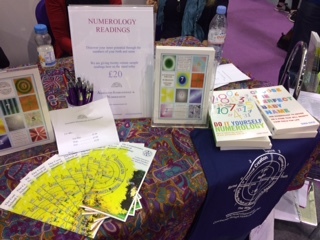 This was a lower number than last year, however, there was strong appreciation and interest in Numerology and the school courses and it was great to have the beautiful new School leaflet to give people. 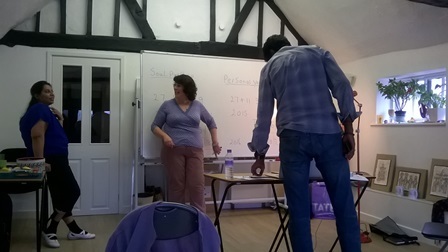 Sonia gave a talk on Friday afternoon with 20 people attending. 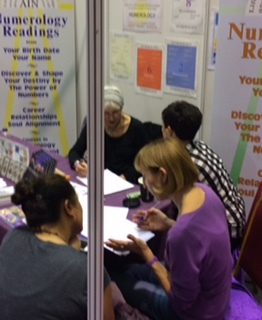 Some of them then came to the stand for readings and to find out more. We believe that the interest shown in the school courses will result in more Foundation courses being held which is very encouraging. 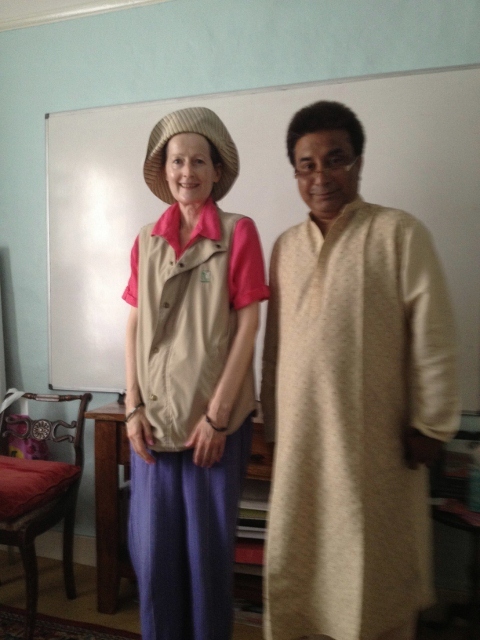 There was also a request for Sonia to give a talk. 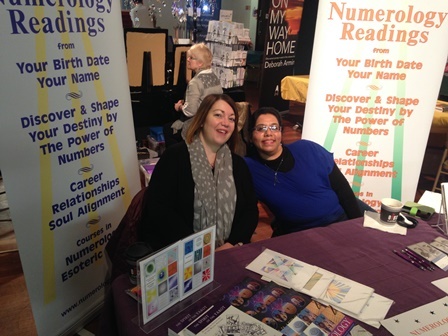 It was an inspiring event and we enjoyed meeting so many people who are very open to Numerology. 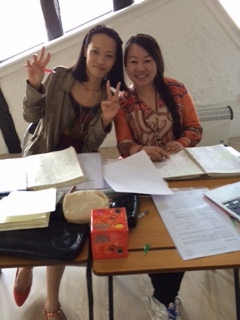 We even had a visitor from Shanghai in China, who is a friend of Wendy Cao one of the School’s teachers in China. 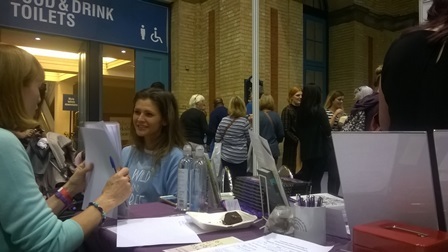 A big thanks to all our members who gave their time especially Gaynor who attended all 3 days and did an excellent job speaking to people at the front of the stand. 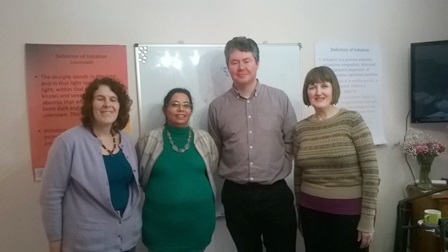 Also to our newer members David Whitehouse who came from Birmingham, as well as Mariella and Elena. 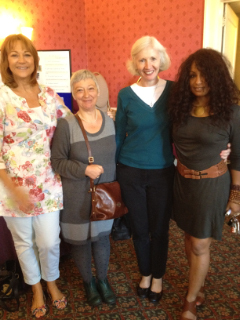 Other members who worked on the stand were Berenice, Gill, Sonia, Jane, Jax and Margarita. 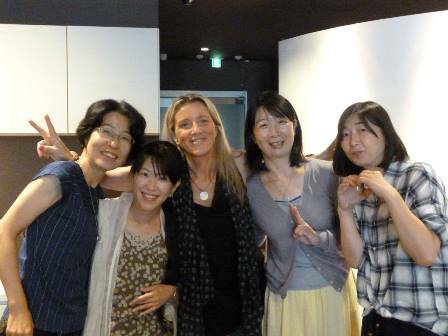 We plan to attend again next year and have already booked to return!" 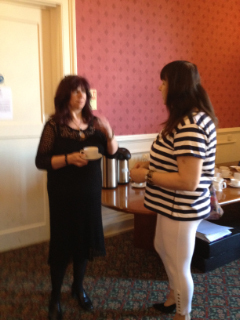 "Some very interesting conversations always take place over the 3 day event. 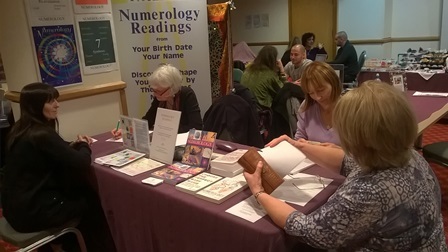 One theme running through this year had to be the many people searching online for inspiration from Numerology, most happy with the accuracy. So I was ready for the arrival of people just thinking they are one particular number! Utilisation of the lovely wall posters 1 to 9 always great tool, just saying read the number of day of Birth and also first letter of their name in Number, just a way of looking at something more, something deeper, also opportunity to demonstrate we are working in cycles of 1 to 9 in time and space. 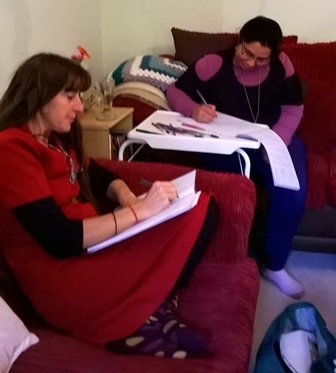 Lovely people working on deep soul work, find some relief from their dark spaces shown via numbers, of how they work in life and how they may lead us to deeper understanding of the journey and path each of us tread. One gentleman so wanted more information on numbers, he was keen but had his own stand so could not easily return on the Sunday. I had a piece of paper with a couple of numbers on for his return but he did not come back. 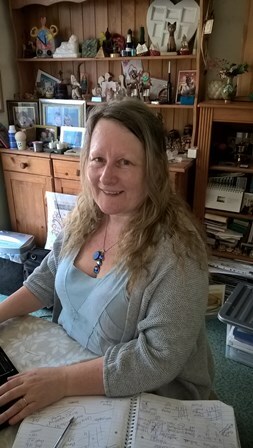 I had a cup of tea whilst waiting for the train and recognised a voice, sitting beside me was the gentleman, a young man on a quest journey, so eager to view numbers and our website. Aways lovely to see our fellow friends, and to meet with new people, a pleasure to attend this vibrant, musical, colourful weekend." 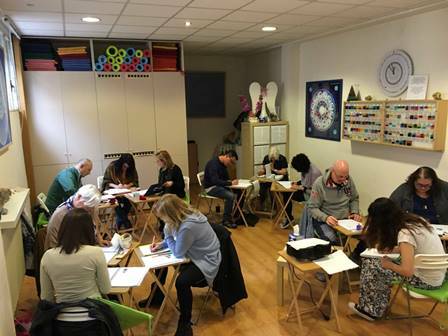 Masters Course in Esoteric Numerology Module 1 12th & 13th June, 2017 10am-5pm 8 Melbourn Street Royston UK. Fee: £100.00 Certificate of Attendance Teacher: Berenice Benjelloun Dip. CSN. AIN. 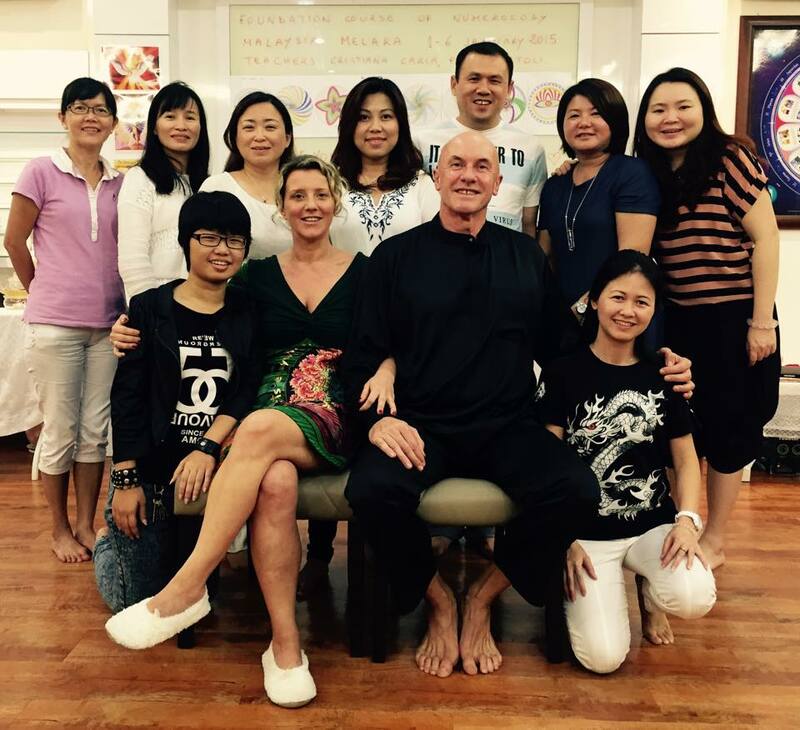 "Over the last few years Wendy Cao and Hanting Hsiao have been training to teach the Foundation Course, and have participated in two Foundation Courses in Beijing (additionally in the UK) and the Diploma Course in May. 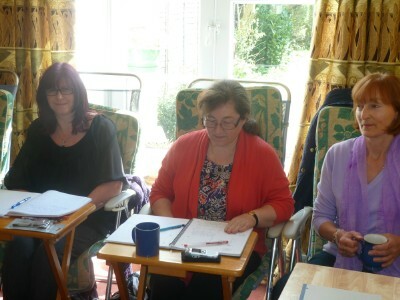 Wendy has organized superb courses throughout. 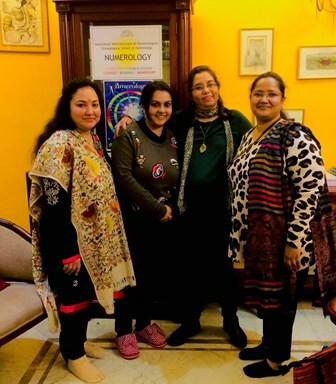 All the students were highly receptive, committed and grateful for the esoteric teachings and were keen to become professional Numerologists with The Connaissance School. However, it was a privilege to work with them and a proud moment for us when the first 9 students passed their Diploma exams and become the first group to represent the School in China. The doors are firmly open. 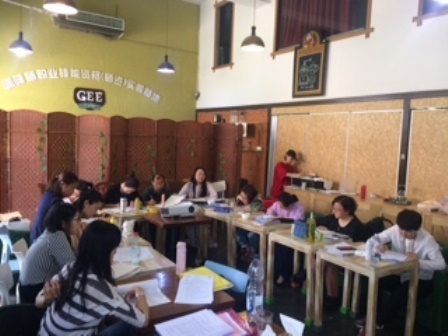 It was also fascinating to discuss the Tao Te Ching by Lao Tsu with the students (part of the course content) - a classic book not only in China but worldwide - based upon ancient wisdom and numerology. 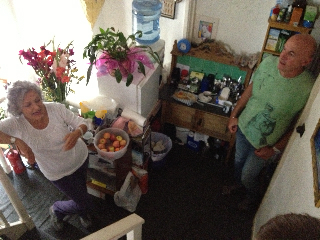 The local people were friendly, helpful and very group orientated. They are proud to work hard - 11-12 hours daily on the course. 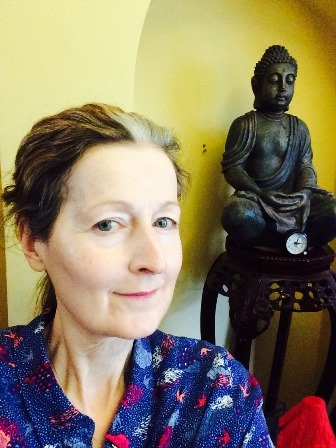 China's culture is rich, and there is much to be learned from all around." Flitwick Fair. Report from Berenice. 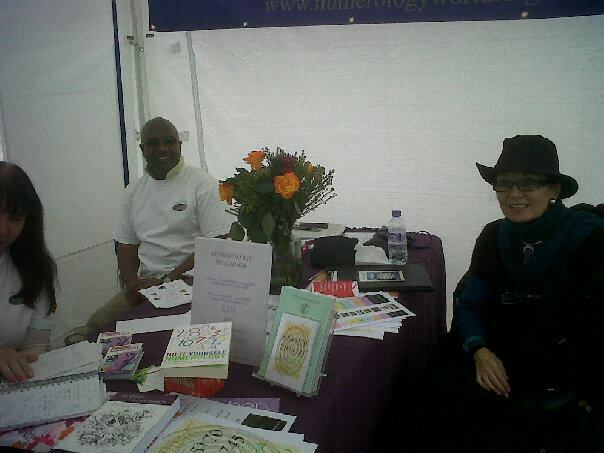 "AIN attended the Flitwick Fair last weekend, the 22nd and 23rd April. 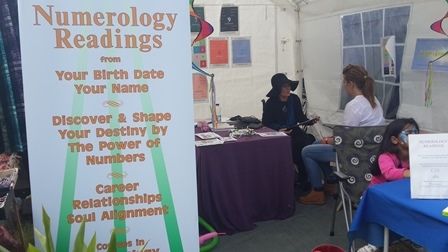 As always it was a very busy and successful Fair and our team of 3 (Sapna, Leigh-Anne and Berenice) did 28 readings over the two days. 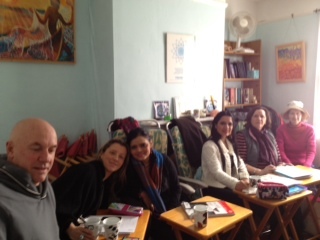 Sapna gave a talk on the Sunday, to which 10 people came. 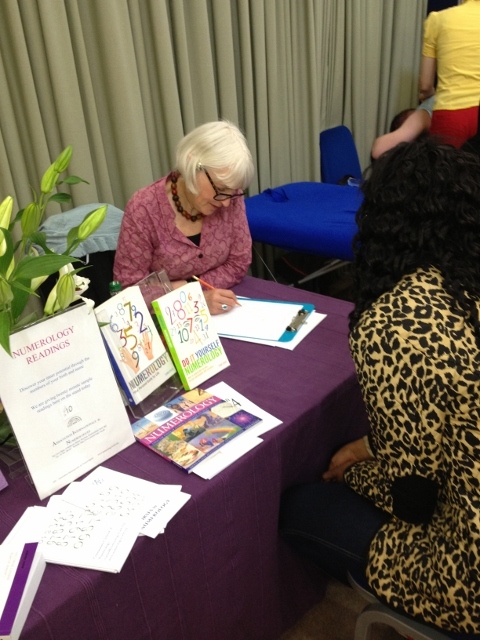 The talk inspired more people to come for readings, so we were busy right up to the last minute." 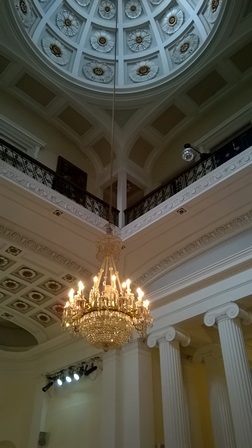 Beeches Conference Centre. Bournville. Birmingham. 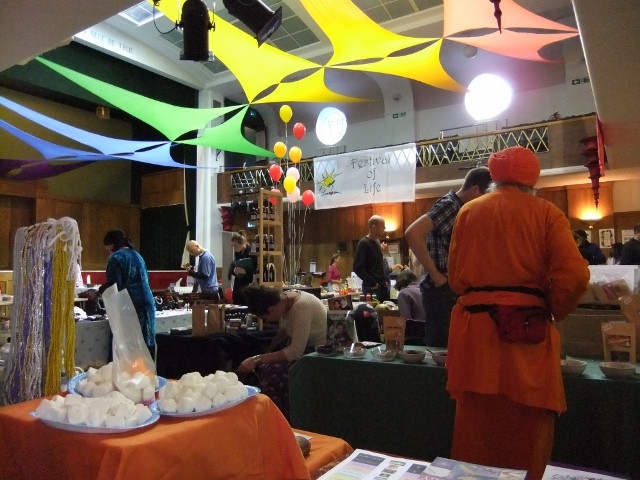 www.treeoflife-events.co.uk. 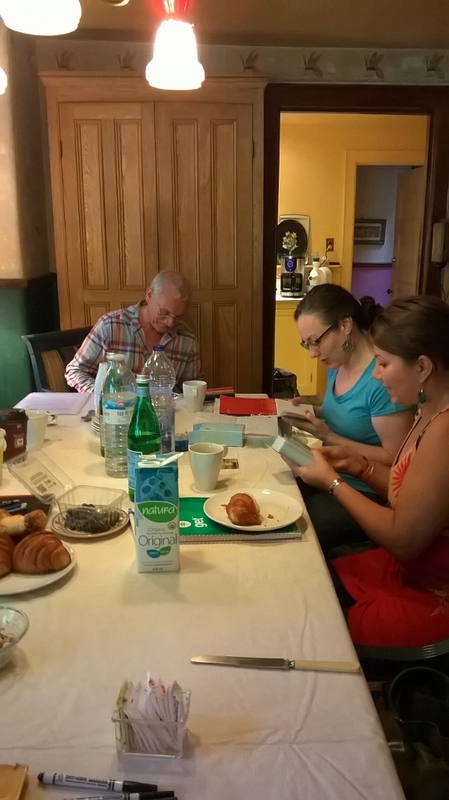 Report and pictures from Sonia. 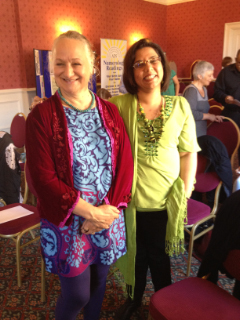 "Sonia gave a Numerology Talk and along with Gill gave Numerology Readings at the Event. It was a busy and uplifting day for all." 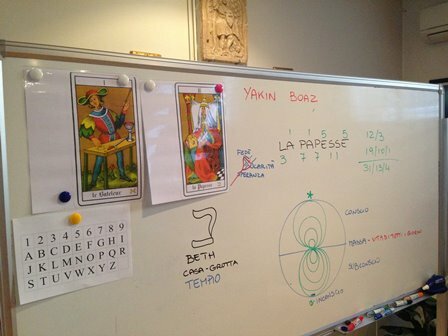 "The Connaissance School's Tarot course as always, was inspiring to both facilitator and participants. 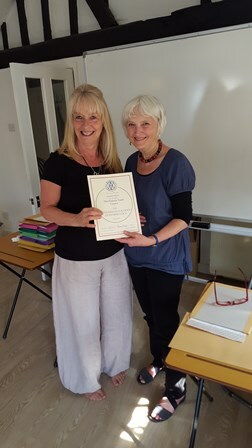 This recent course was attended by Sapna Mohan and Lisa Novelli, and took place at Sapna's Shanti-inner peace centre in St Albans. 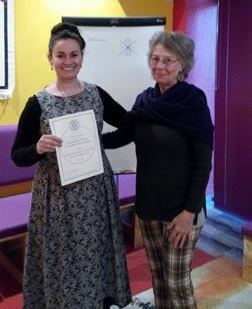 Sapna, already a Connaissance School teacher, celebrated her new qualification as a teacher of the Tarot!" 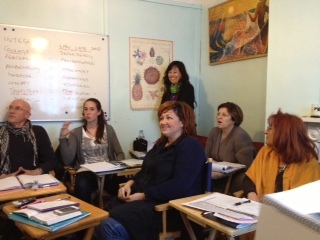 The final part of the Foundation Course took place and it was very good. 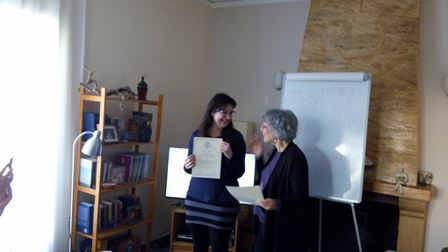 The Certificates were given and everyone was happy. The attached pictures give an idea of the atmosphere/energy. 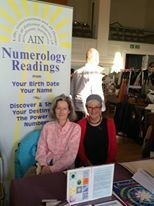 AIN had a very successful day at the MBS Phoenix Event in Harpenden, which took place on Saturday the 4th March 2017. 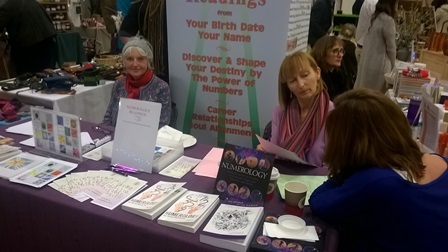 Sapna, with help from her friend Graham Few, set up the stand and both Leigh-Ann and Sapna did readings which were enthusiastically received. 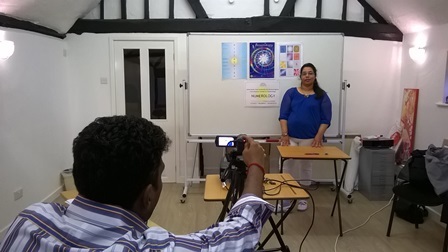 Interest in the Connaissance School Courses was stimulated by the talk, 'Introduction to Numerology, your Birth Date and what it means' given by Sapna. 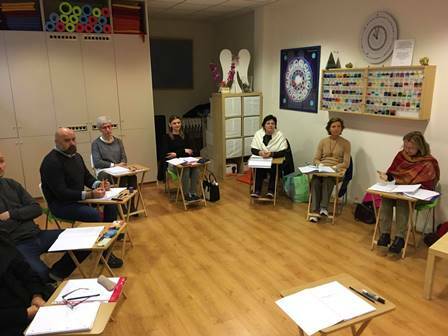 Foundation Course in Esoteric Numerology 11th - 16th February 2017 Teacher: Berenice Benjelloun Dip. CSN. AIN. 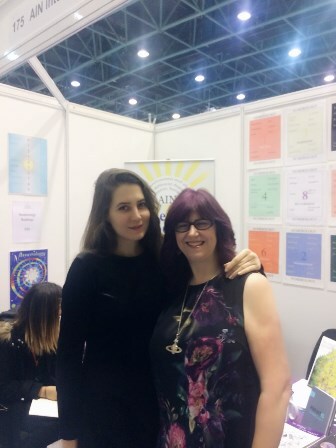 "It is over 24 years ago, before the Connaissance School was founded, that Claudine taught a group in Poland the systems of Numerology. 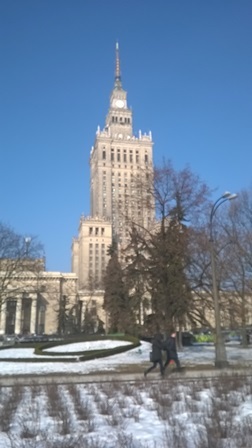 I went to Poland last year and met up with some of the same people, so when I suggested that we could organise to give the Foundation course, it was like the germination of a seed which had been planted all those years ago. 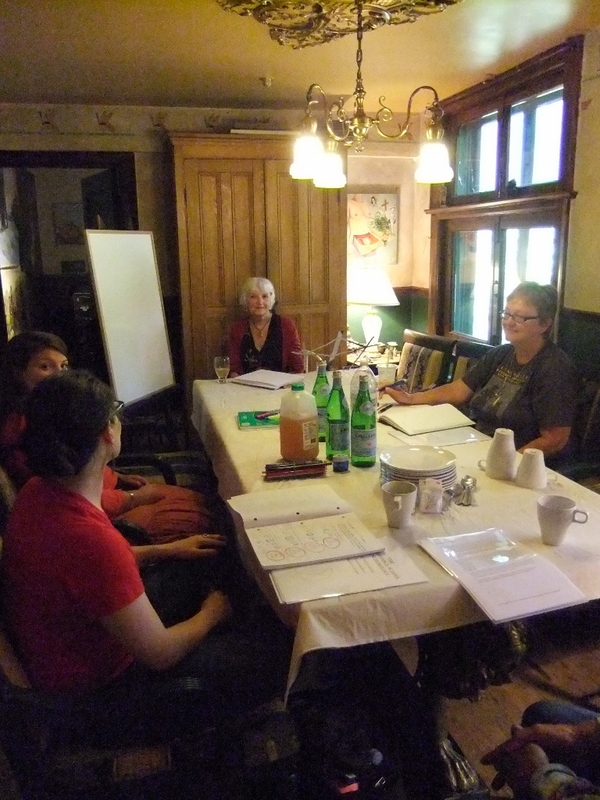 Margot Graham's great organisation skills were activated, and she gathered together a group of 14 committed students. 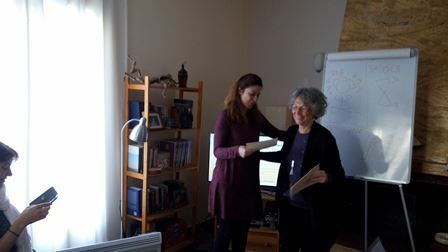 Anna Kinecki undertook the major task of translating the Student notes and also acting as interpreter during the course. 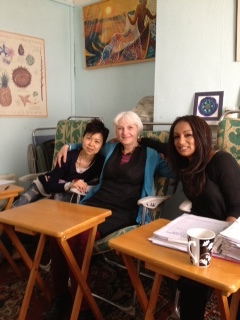 Without their invaluable and skilful help the project could not have been realised. 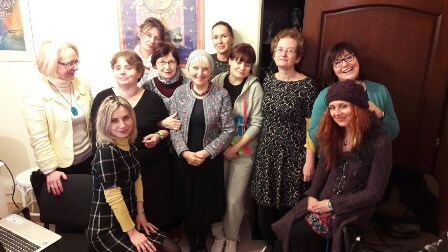 The Foundation course then took place in February and was received with much enthusiasm by all, including myself, in Warsaw. There was much interest in doing the Diploma." 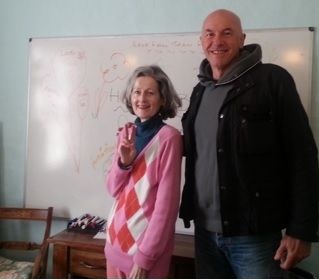 4 February 2017 Report and pictures from Sonia. 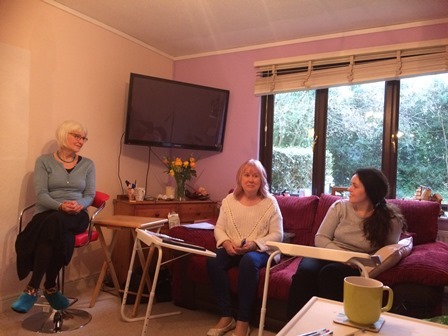 An AIN Council Meeting was held at Christine's house at Watford. 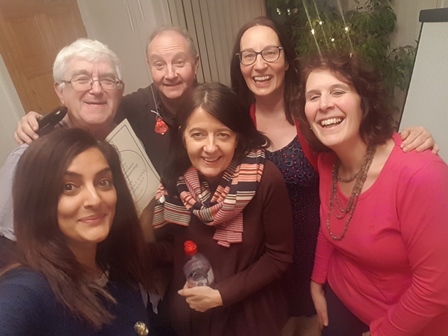 Berenice brought a Traditional Chinese New Year Cake back from Singapore and we celebrated: Claudine, Berenice, Gill, Gaynor, Colin, Leigh-Ann, Arthur, Colin and Sonia. It was a productive meeting as ever. 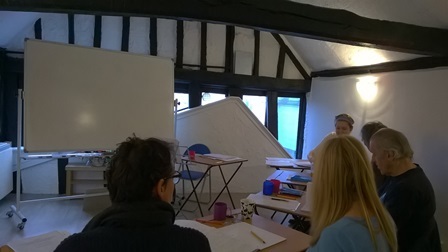 Masters Course Module 2. 23rd - 24th January. Fukuoka, Japan. Teacher was Cristiana Caria. 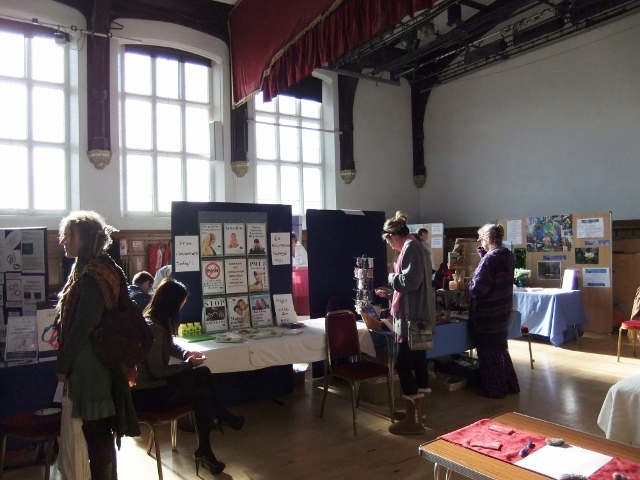 Margarita and Berenice set up a stall at the King's Langley Advert fair, which took place on the 26th November. 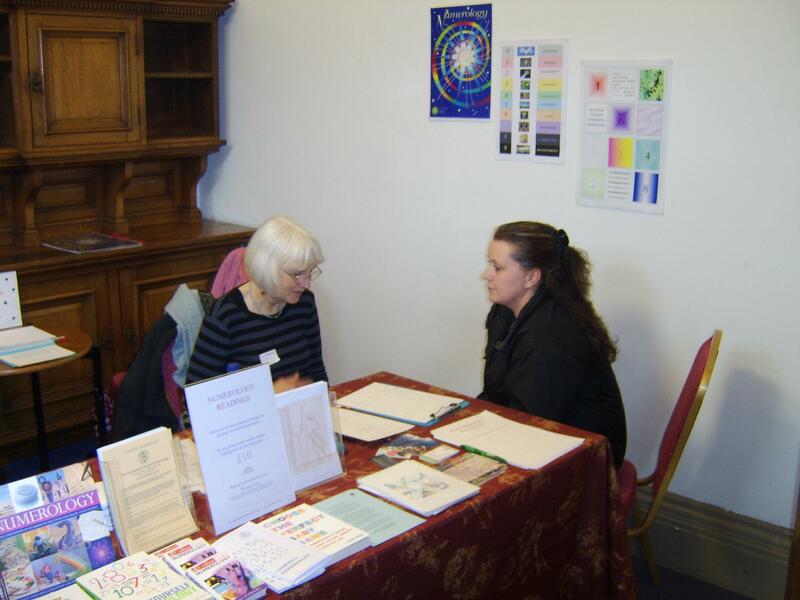 We had a good table in a central position and those who came for readings were enthusiastic and uplifted by the information they received about the School and their inspiring charts. 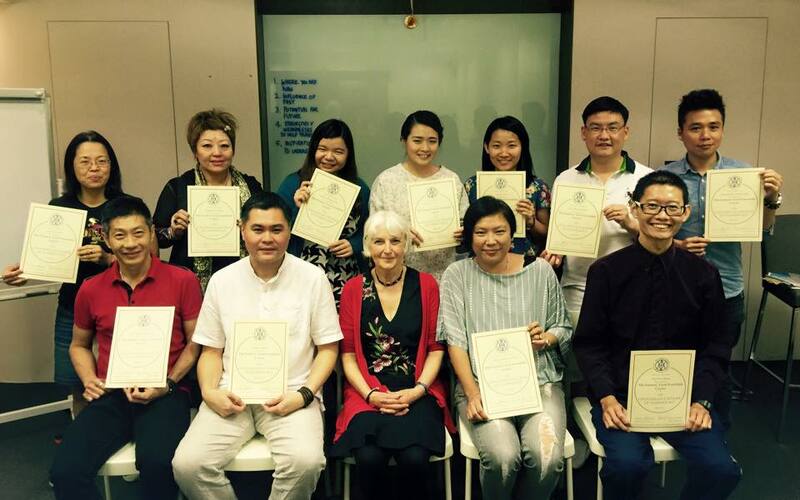 Foundation Course English and Chinese speaking students Simultaneous Chinese Interpretation available 21-24 November 2016 (Foundation Course) Connaissance School, 8 Melbourn Street, Royston SG8 7BZ U.K. 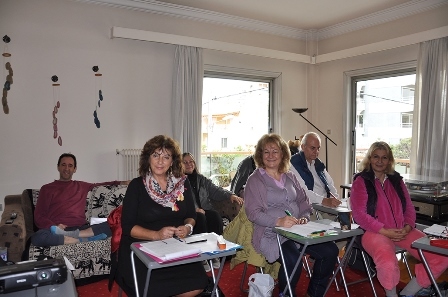 Diploma Course in Esoteric Numerology 25th - 28th October, 3rd-4th, 10-11th, 17th-18th, and 24th-25th November 2016 Teacher: Berenice Benjelloun. 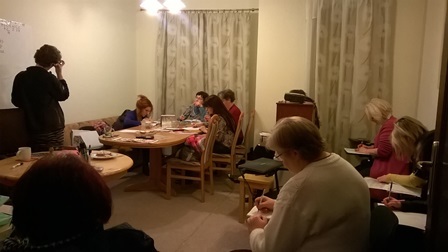 Location: 14 Blueberry Close, St Albans, AL3 6NH Organiser - Sapna Mohan. 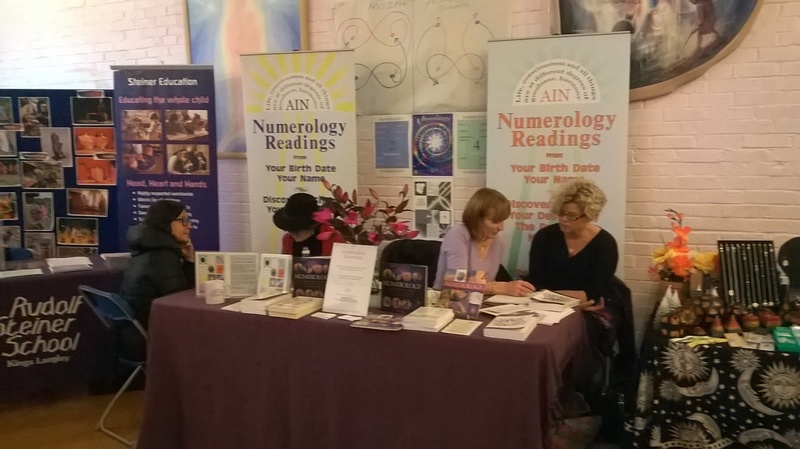 Numerology Talk and Readings with AIN 21-23 October 2016 The Great Hall - Stand 176 Alexandra Palace, London N22 7AY www.alexandrapalace.com/whats-on/the-mind-body-soul-experience Friday 21st October 2 - 3pm Londesborough Room What is Numerology? 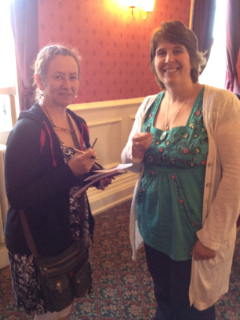 With Sonia Ducie http://mbsevents.co.uk/mbs2016/ShowGuide_MBS_2016.pdf. 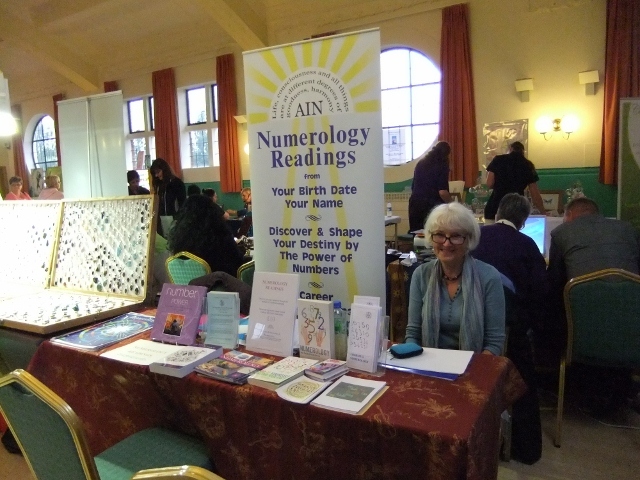 Report and photos from Sonia Ducie: AIN members - Gaynor, Sonia, Gill, Berenice, Leigh-Ann, Jane, Margarita - gave over 50 numerology Readings at the Mind Body Soul Experience, Alexandra Palace on 21-24 November 2016. 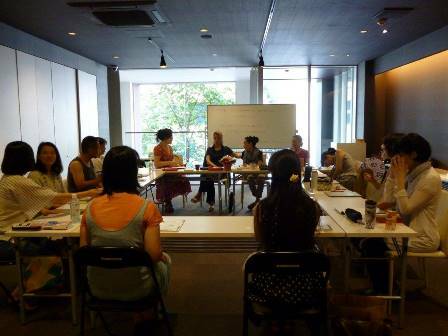 Sonia also gave an Introductory talk. It was an uplifting long weekend. 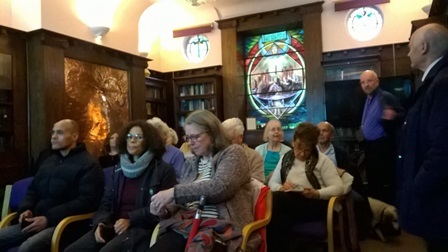 Report and photo from Gill: Well attended event at the Beeches Conference centre in Bournville, attended by David Whitehouse and Gill Kissane from AIN. 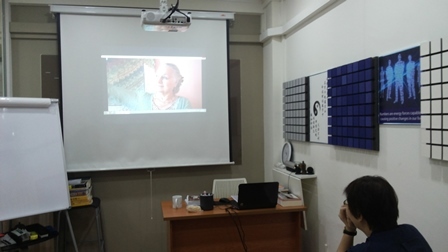 'The video recording was part of a project instigated by our member Sapna Mohan to give a live stream Skype talk to an audience in New Delhi, India. 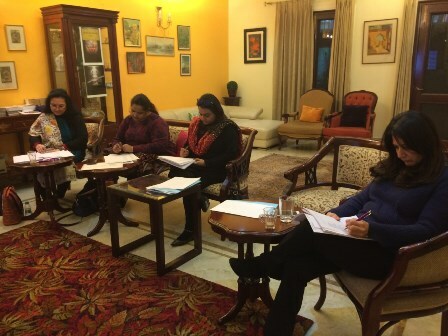 This had the purpose of stimulating interest in a Foundation Course which will take place in New Delhi in March 2017. 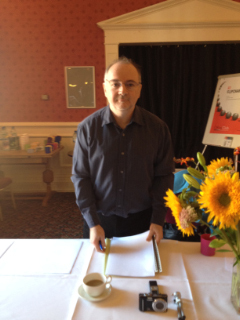 The 3 hour talk took place successfully on the morning of the 8th October. 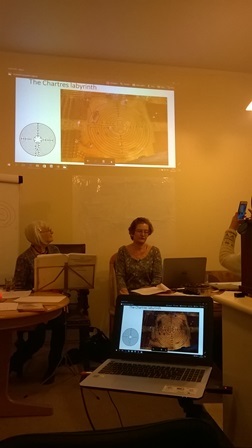 The recorded video was interspersed with live streaming, to give basic information about esoteric Numerology and to describe the activities of both the Connaissance School and AIN. 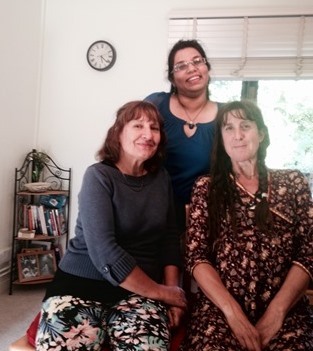 Sapna, Gill and Berenice took part in the video and live streaming. Without the dedication and patience of Ramachandra Jayachandra, who filmed, edited and was our technical director, and without the help and organisation in Delhi of Naresh Mohan and Vikas Mohan, it could never have happened. 1-6 October 2016 leading to Diploma Course May 2017. 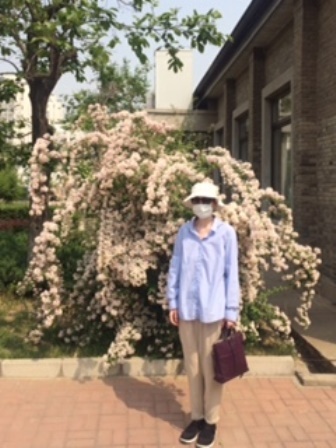 Marco Polo Cultural Estate, Chaoyang District, Beijing. 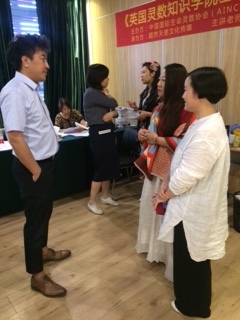 Wendy Ciao with the help of Hanting Hsiao once again organized a superb venue and a smooth running event. 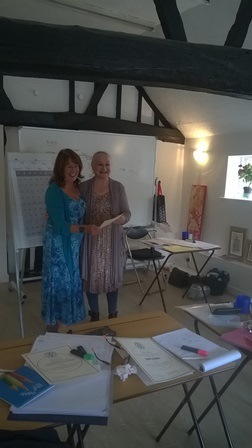 Wendy also gave each student their own copy of the Tao Te Ching, which they truly relished after the relevant powerful process at the end. 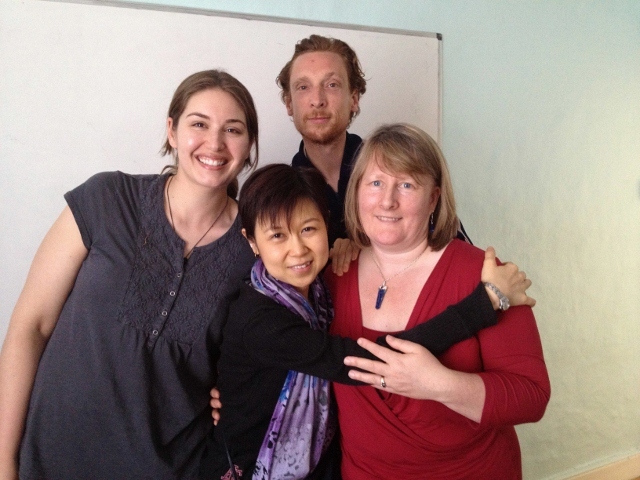 Wendy and Hanting are China’s first Connaissance School Teachers. 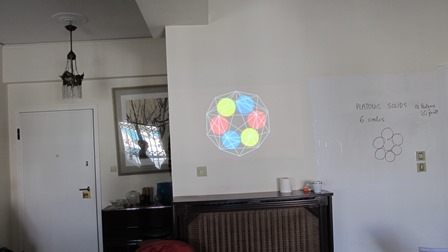 The Foundation Course Slide Presentation was provided in Mandarin and English, which the students found illuminating. 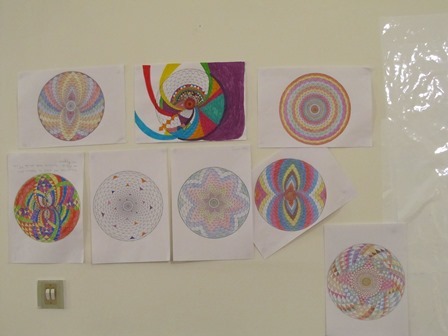 Soul connection was made by the students drawing and writing everything themselves in pencil after. 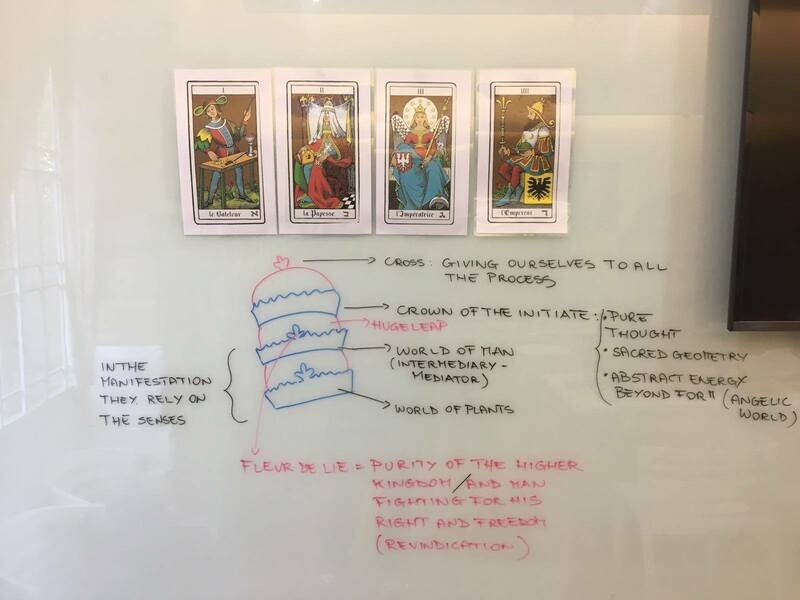 They were – as last time – deeply moved by group soul – and easily recognized and experienced the process of intellect and intuition. 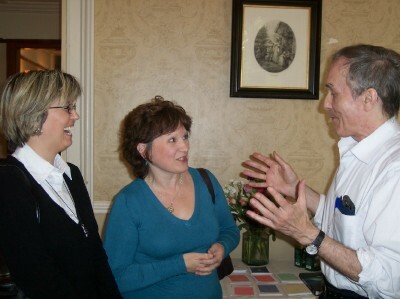 They were a highly interactive group. 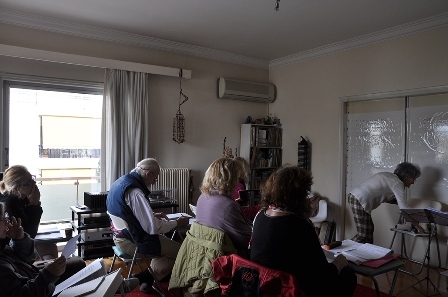 Indeed, by the end 5 students had already booked on to the Diploma Course next May 2017, and some had expressed interest in the Teacher Training. Step by step. There was a happy, relaxed, social element to the Course - the venue being a specialist Coffee Centre Café - and at breakfast, lunch and tea the smell of the real coffee beans was intoxicating - As above, So below. 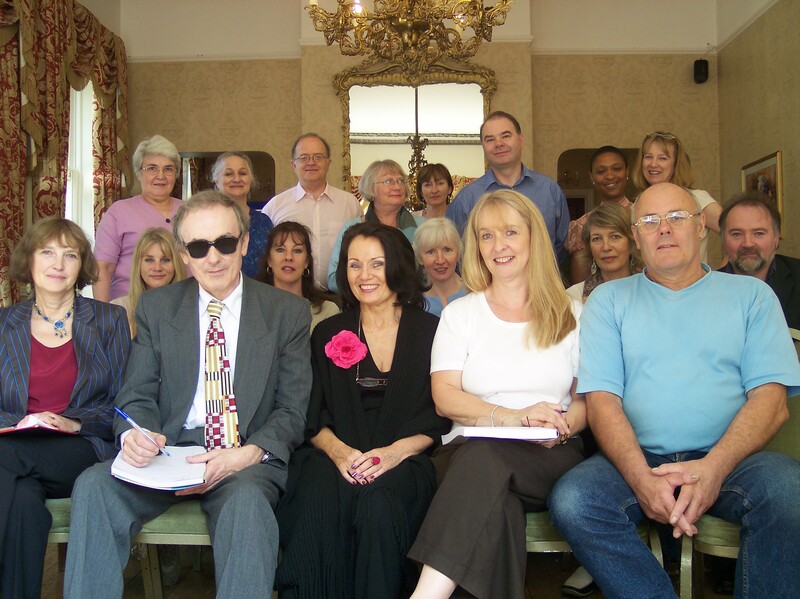 AIN Annual General Meeting 11.00 on Saturday, 10th September, 2016 The Cave Shop, 8 Melbourn St, Royston, Hertfordshire. Lunch will be served at The Old Bull. All AIN members welcome. AGM 23 at The Connaissance School, Royston. 10th September 2016. 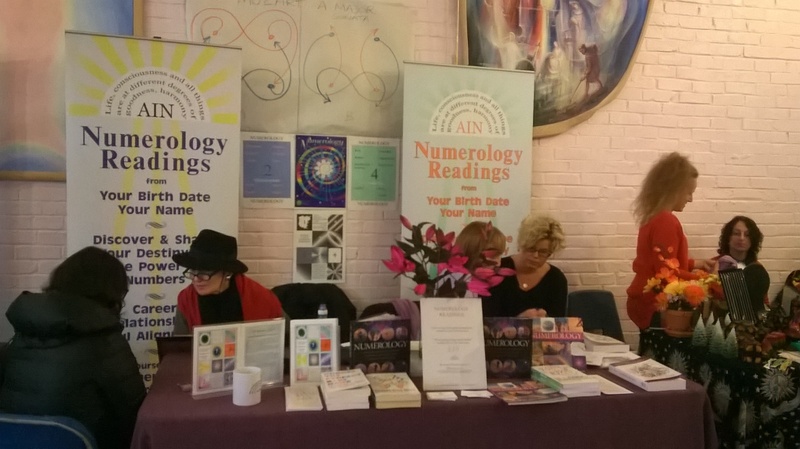 We were delighted to hold the Association Internationale Des Numerologues 23rd AGM for the first time at The Cave Shop in our large and bright James I Room. 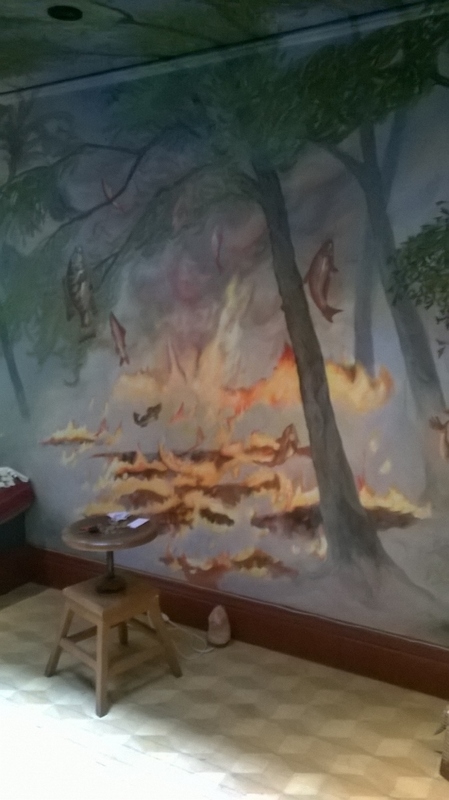 (For historians James I slept in that room hence its name ). 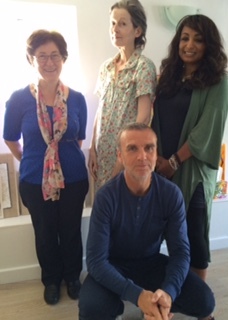 We said goodbye with gratitude to Paul Elkerton who resigned as Chairman, and welcomed Berenice Benjoullon to the post as Chairwoman and Margarita Coleman as her Deputy. 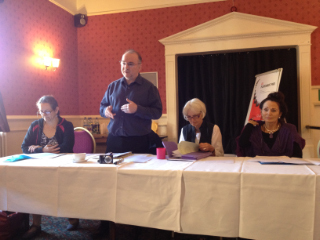 The event was well attended and it was inspiring to see many new faces too. 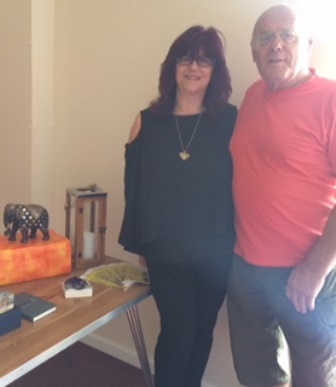 At the end of the formalities we enjoyed our annual raffle with luxurious presents from The Cave Shop. 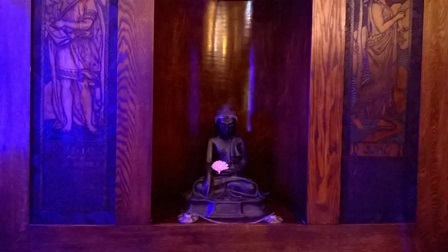 Jax won a big Blue porcelain Buddha, Jayne won a large ceramic white angel, and so on. 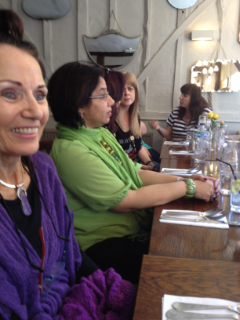 Lunch was served at The Old Bull with a wonderful menu and atmosphere. 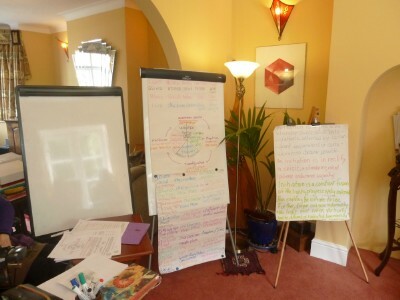 During the afternoon Claudine presented an inspirational and fascinating workshop as always, based on new material from her next post graduate series - Masters Module 3. 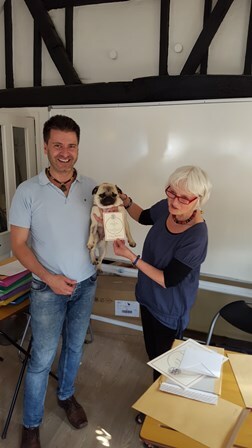 Finally we were happy to celebrate the 9th birthday of Claudine's most gorgeous little dog Pi - the star of the day. Look forward to meeting up with everyone again next year on 23rd September 2017. 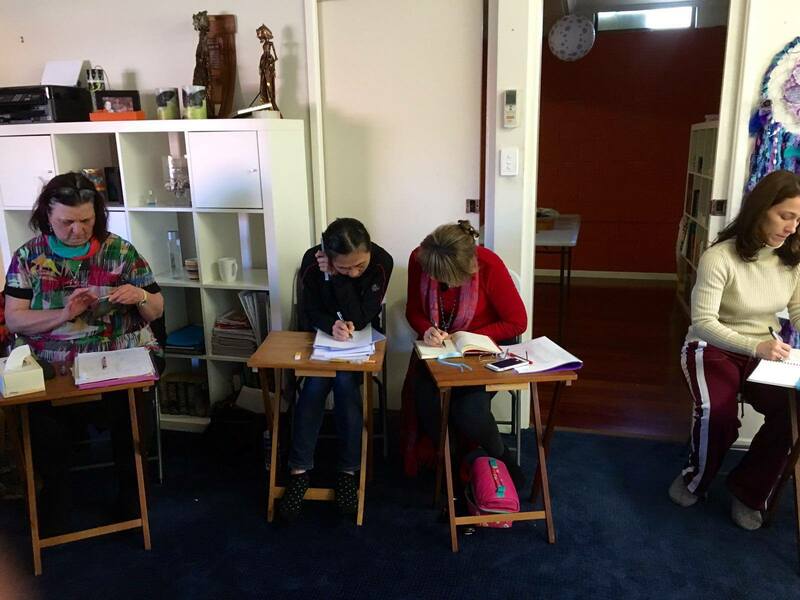 Masters Course in Esoteric Numerology Module 1 27th & 28th August 2016 10am-5pm 8 Melbourn Street Royston. 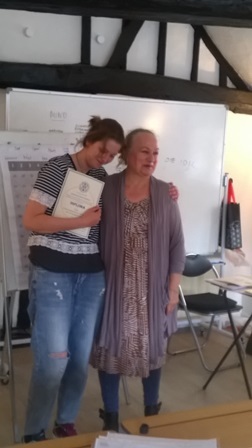 so well; also to Ania for being such a great interpreter." 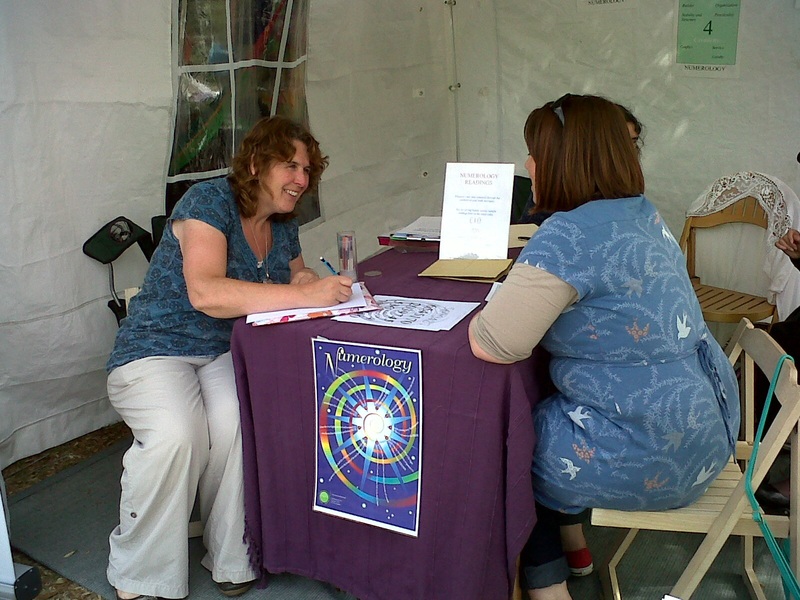 Numerology Chart reading day Friday 3rd June - 11am - 5.30pm Cost £25 - All questions and charts welcome. 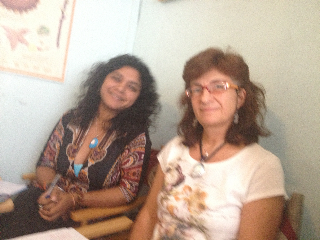 The Cave Shop 8 Melbourn Street Royston SG8 7BZ Facilitator: Berenice Benjelloun Dip.CSN. AIN. 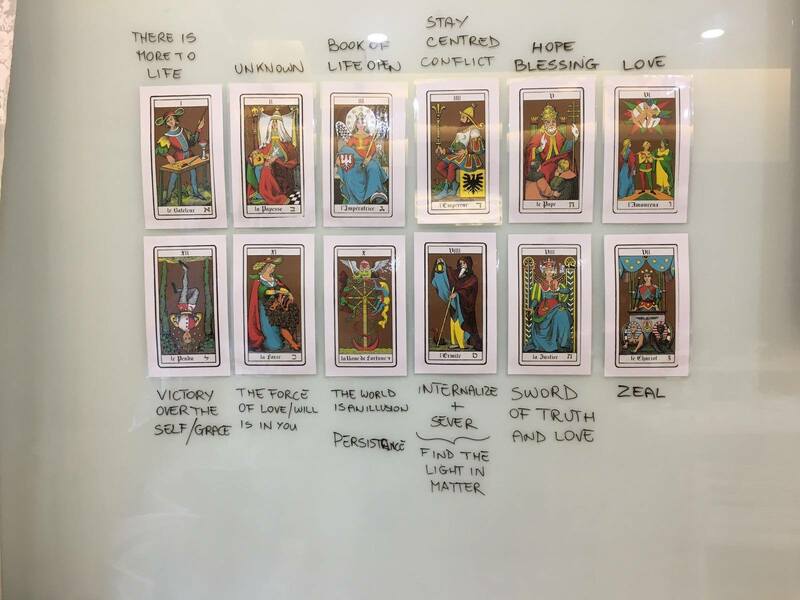 "On the 12 day Tarot course we were delighted to welcome two members who had travelled from Greece and Malaysia especially to attend, along with four others from the UK. 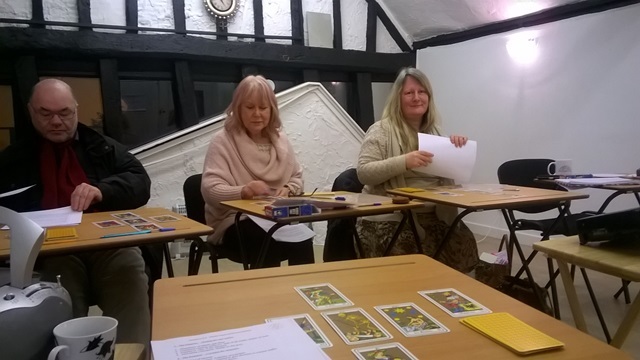 Four of the six students were trainee teachers, so are now or will soon be qualified to teach the Esoteric Tarot course themselves. 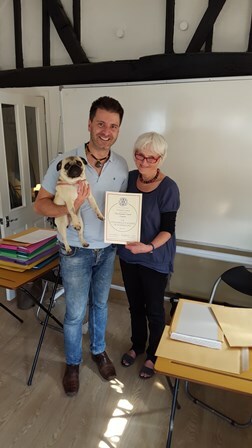 We also had the Lovely Lily with us, who followed the course right the way through, fulfilling her doggy role by barking at exactly the right time in one of the visualisations!" 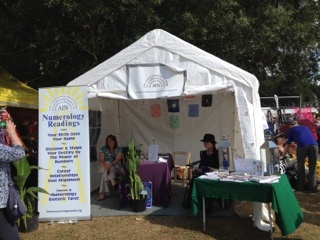 Readings on the AIN Stand at the Tree of Life Festival, Bournville, Birmingham on 9th April. 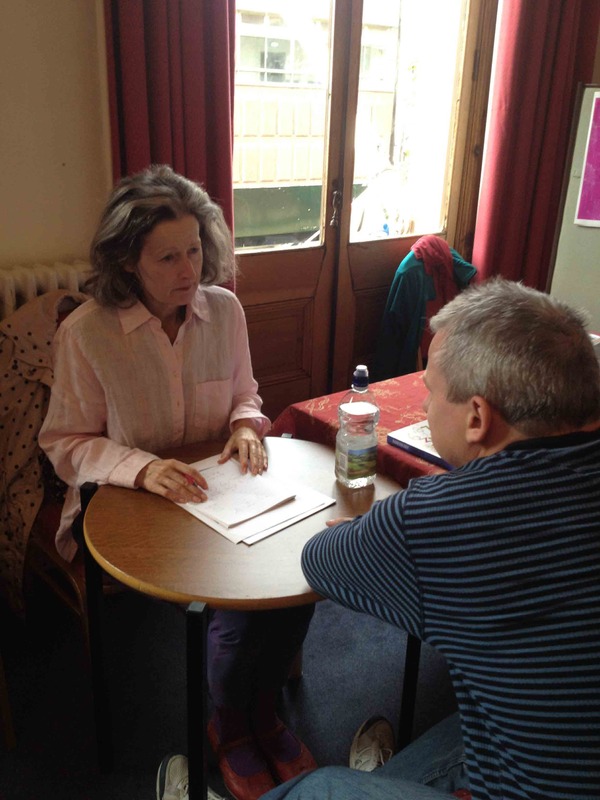 Sonia gave a talk, What's In A Name, to around 60 people at the event which was super busy. 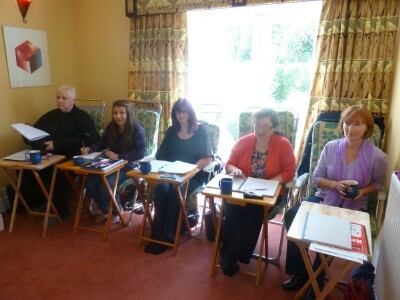 Location: Watford WD18 7LL Spaces limited Teacher: Christine Tonks Dip.CSN.AIN. 12th March. 2 - 5 pm. 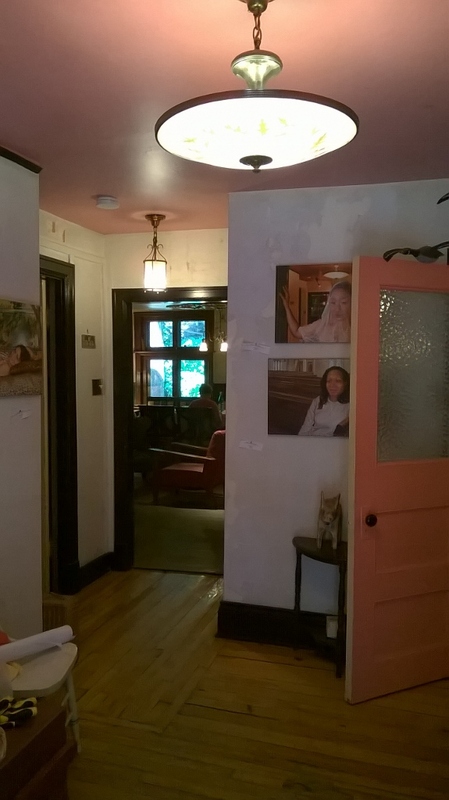 Sapna Moran's house. 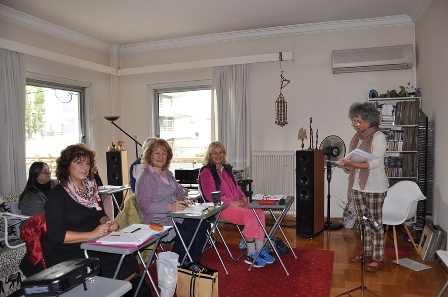 Report by Berenice Benjelloun Dip. CSN. AIN. 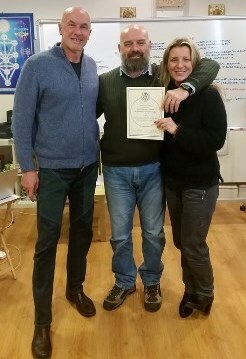 The 2nd Foundation course in Athens was received with great enthusiasm and all the students committed to doing the Diploma, which we plan to arrange in July. 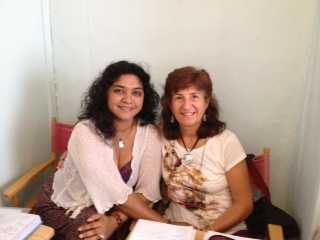 Thanks go to Christina for translating so smoothly and efficiently! 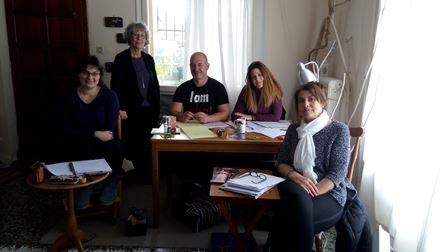 10 people attended an extra talk to introduce AIN and the Connaissance School to new people:- from the interest engendered by this we plan to run a 3rd Foundation, which will complete Christina's Teacher Training. 23rd January. 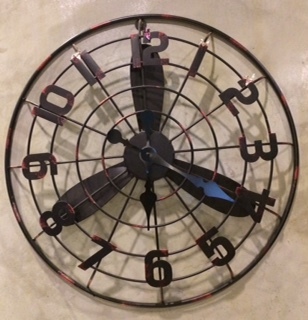 2 - 5 pm. Sapna Moran's house. 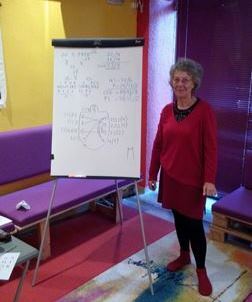 General Introductory talk about Numerology and the Connaissance School given by Berenice Benjelloun Dip. CSN. AIN. 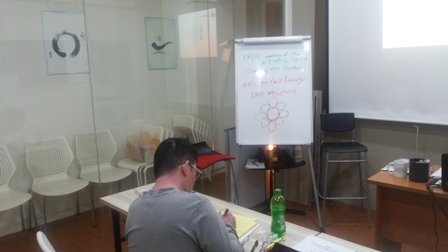 It was a privilege and an honour to facilitate the first Connaissance School Foundation Course in Esoteric Numerology at Pathlight Zone in Singapore in January, 2016. 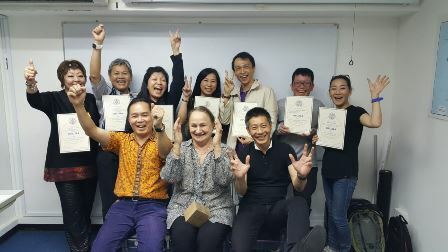 Stanley Tan and business partner Ivan organized the event with supreme efforts – 8 students and 3 Teacher Trainees including themselves – it was very successful. The students participated fully and were extremely receptive. 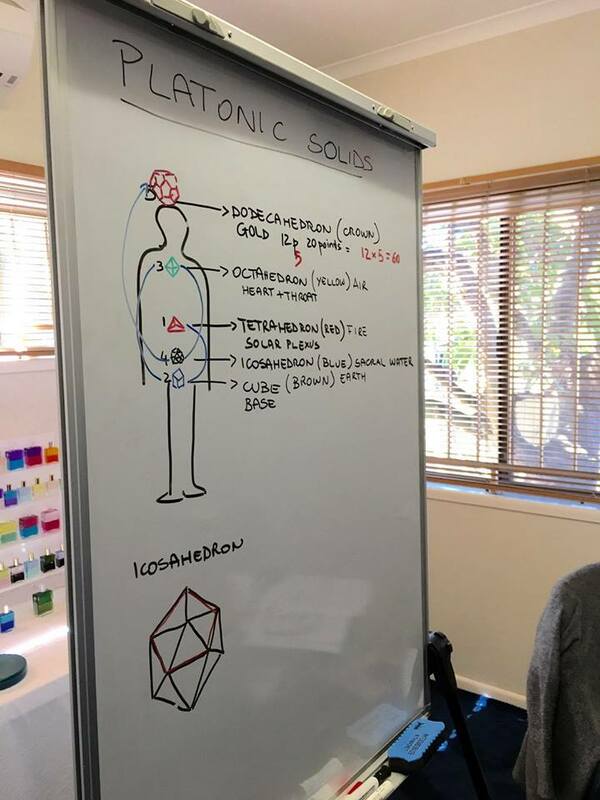 They worked through sacred geometry, the platonic solids, mathematics, the I Ching, Birth Charts and Name Numbers, the Kaballah, the Grid, and meditation / creative visualization in order to go deeper in to soul. 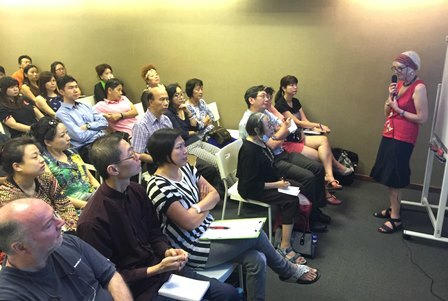 Indeed, Esoteric Buddhism is very popular in Singapore right now so somehow they were waiting for Esoteric Numerology – and here we were. Whilst the 35+ degrees heat was intense, the spiritual heat was turned up as the students journeyed inwards towards their Soul. There was some humour as well as some deep Soul contact and bright light. 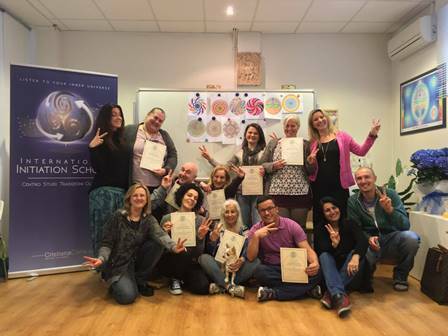 Finally, all the students who finished the course received their Certificates we were all very proud. 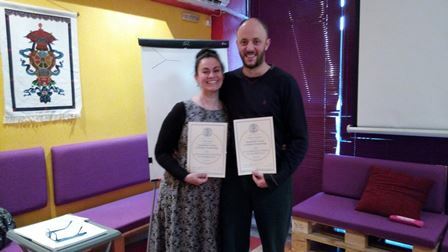 As were Stanley and Ivan when they received their Connaissance School Teaching Certificates. 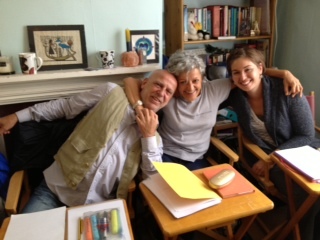 Liz is finalizing her Teacher Training soon. It was a wonderful experience and the start of a whole new era for The Connaissance School. 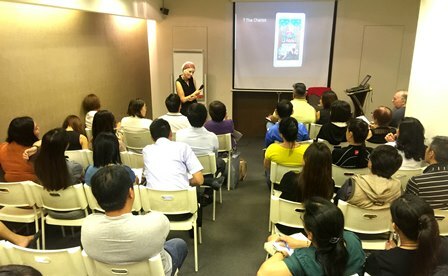 Stanley, Liz, Ivan and myself attended Thomas Chiam’s 7th Life Quest / AIN event at the UE Business Conference Centre in Singapore. 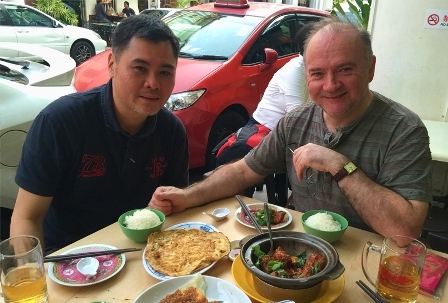 I was sat with Paul Elkerton (AIN Chairman) who delivered a marvellous speech about the expansion of the Connaissance School in Singapore, Malaysia, Italy, Greece, China and Canada, and with more countries to follow. In reflection, it was through Thomas that the whole Connaissance School has materialized in Singapore. 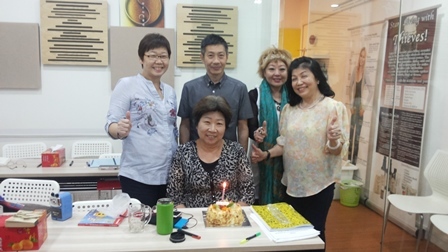 That is, Stanley attended my Numerology Names Workshop at Life Quest (Thomas provided constant interpretation into Mandarin) back in January 2013.He was definitely earmarked as a Connaissance School Teacher even back then. 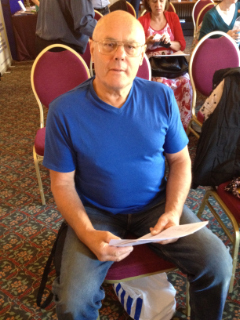 Thomas is gifted with the amazing lifestyle products that he develops, and provides inspiration to over 5000 members, and to the promotion of Numerology in the East. 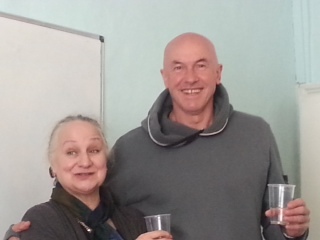 It has been a gift for AIN to work with Thomas for more than 4 years in such a positive and productive way. 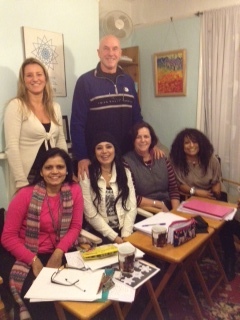 We are one group working with our own gifts in order to spread the light, soul and upliftment of consciousness. Finally, Singapore is a very abundant, highly educated, and happy city, and seeing the number of Hexagons literally everywhere - cemented onto the side of sky scrapers, on hotel wallpaper, on glass lifts, is of no surprise. The influence of the Number 6! The 6 million people that live there enjoy low pollution, no homelessness, and generously low taxes. Even the Shopping Malls smell of sweet perfumes, and display beautiful flowers. Singapore is one sensory delight. The citizens are extremely community orientated, interested in welfare, children and family. The whole road systems and city has been designed with Feng Shui so Singapore there is a sense of gentleness even on the busiest roads. More importantly, it is good place to welcome soul in (6). Finally the well used abbreviation for Singapore is – Sg = 17/8. Positive Karma. Alignment. The Path of Truth. 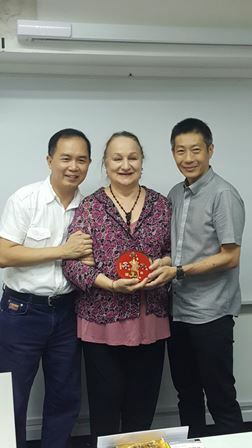 I thank Stanley, Ivan and Thomas for a very welcoming and uplifting stay in Singapore, and wish The Connaissance School and everyone much success and co-working in future. December 2015 13th December 2016. 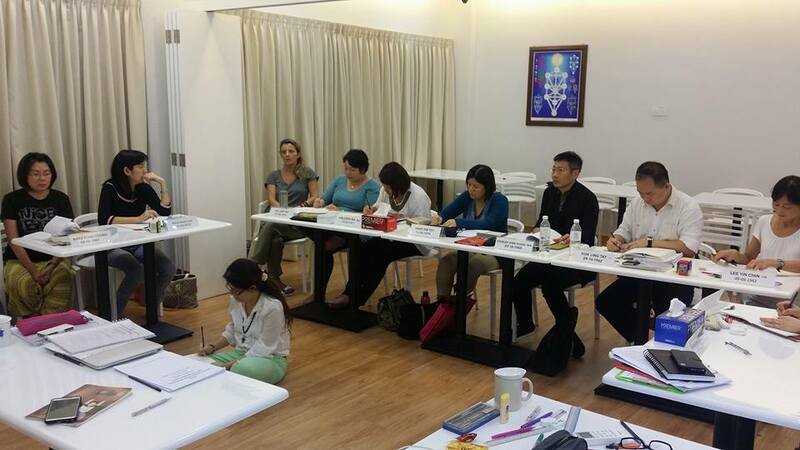 Masters Module 2 at Melaka Malaysia. 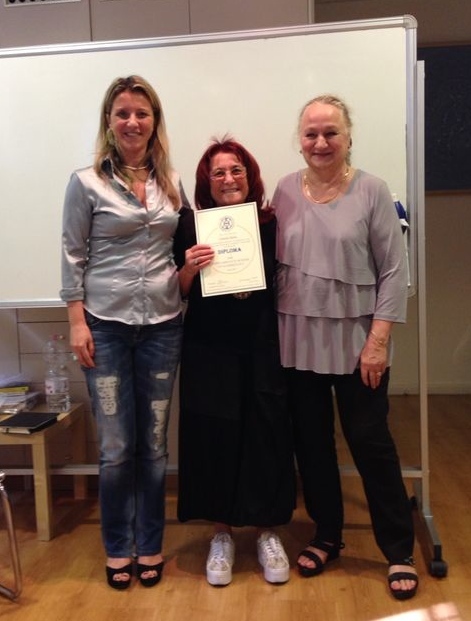 The teacher was Cristiana Caria Dip. CSN. AIN. 10th - 11th December 2015. 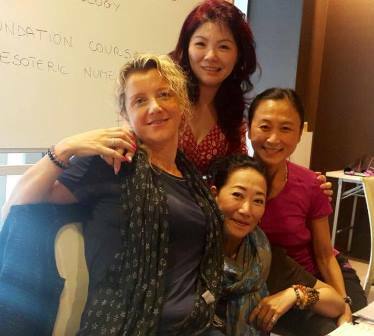 Masters Module 1 at Melaka Malaysia. 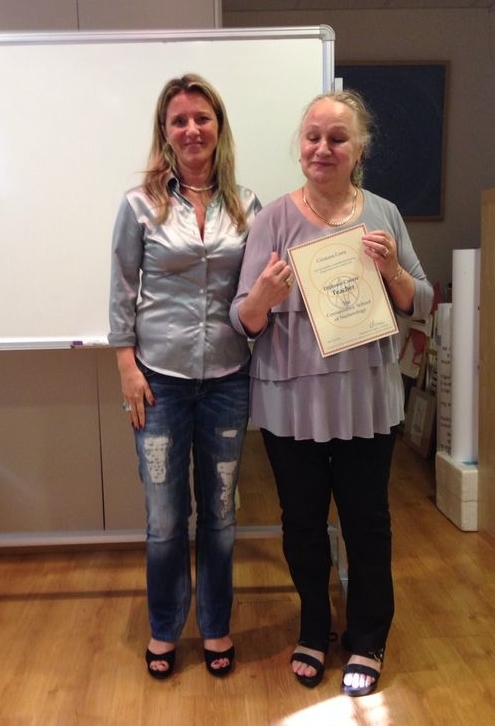 The teacher was Cristiana Caria Dip. CSN. AIN. 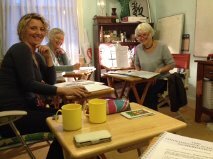 Numerology Foundation Course - Teacher Training - with Sonia In November at The Connaissance School in Royston - Hayley, Joanna, Margaret, Jenny. 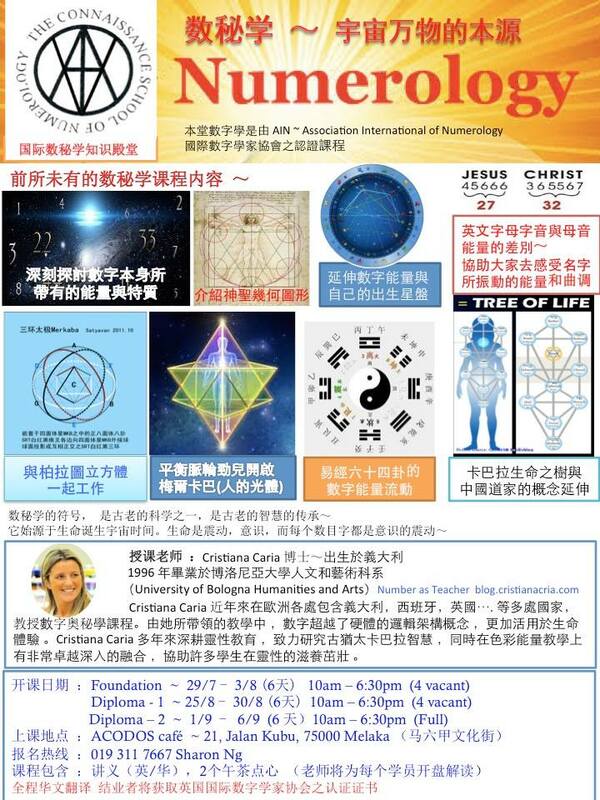 (English / Mandarin) Connaissance School Esoteric Numerology Foundation Course 1-6 October 2015, Beijing. 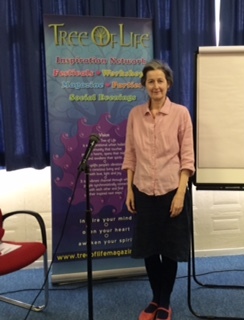 Love & Relationships Workshop. 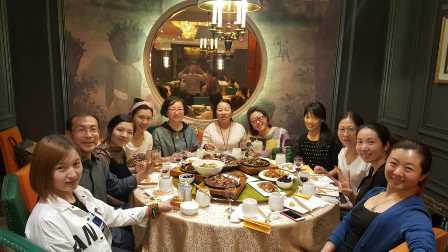 8/9 October, Beijing. 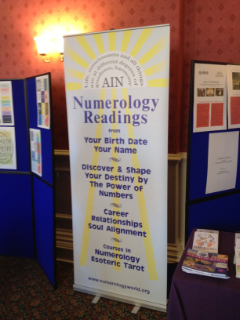 Business Numerology Seminar10/11 October. Beijing. 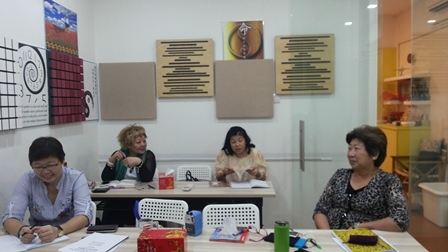 The mission of my first visit to Beijing, China in October 2015 was to facilitate the completion of The Connaissance School Teacher Training Programme for Ms Han Ting Hsiao and Ms Wendy Cao, and to participate in the announcement of the intention to form AIN China (AINC). 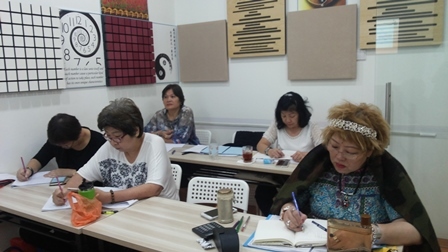 In addition, to further the students experience of esoteric numerology, its practical use by providing Business Relationship Workshops, Readings, and to attend business meetings. 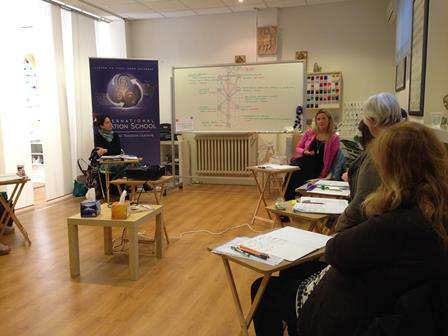 Around 24-28 students attended the Esoteric Numerology Foundation Course. 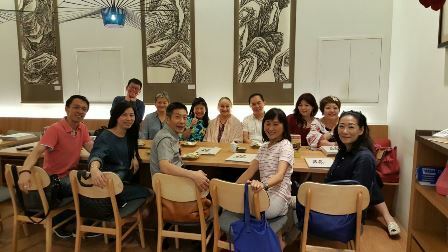 The venue was located at Gee Café in Chaoyang District Cultural Park, which was a private estate surrounded by persimmon trees bursting with fruit and leafy bamboo trees. The groups were exceedingly well looked after by Gee Café staff and Wendy’s team, who had put much practical effort into the smooth running and organization. 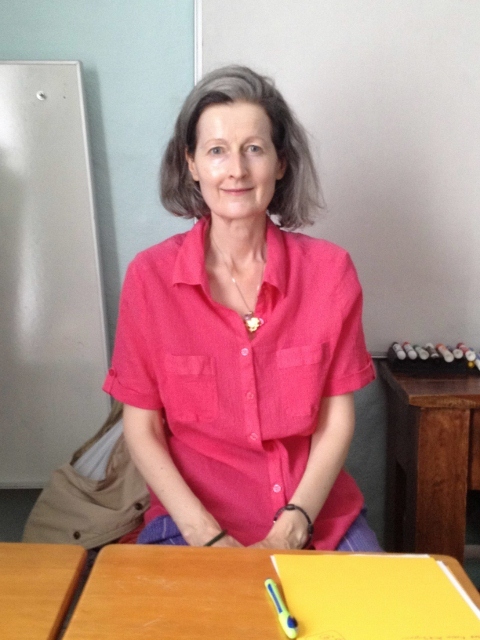 Carol (Wendy’s designer) made a grand job of producing CSN / AINC posters; it was interesting to see Claudine’s name had inherited a letter Z. Aegerterz (Z = 26/8 / China = 26/8). The Guide! Perfect. 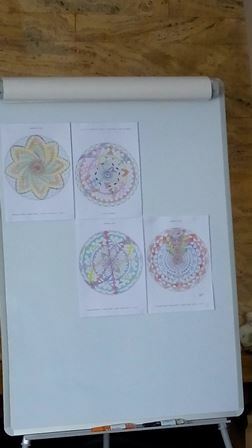 It was moving to witness the students’ group/soul awareness blossom throughout the week. 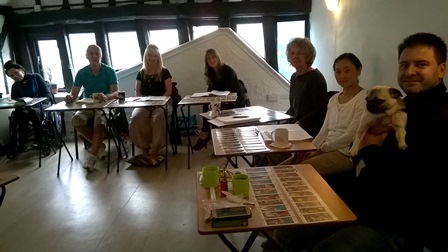 They were particularly receptive and asked important questions, ‘Do we Chinese ask the same questions as the students on the courses in England?’ The recognition of the one Soul is what the Course is about and the students were all moved by the power of the connection. 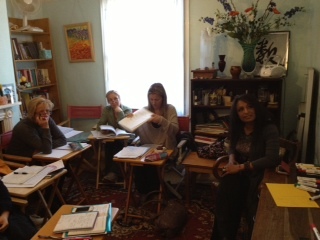 They loved the inclusion of the Tao Te Ching. There were also some interesting observations regarding Chinese names. Some of their names contain vowels only (the rhythm provides the instrument / behaviour / personal intent – the sound provides the soul). Of course Mandarin is all about the use of sound. It is also interesting that there are differing variations for exploring names in Singapore, Malaysia and China. 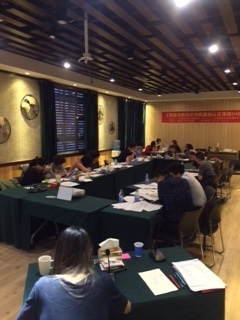 My 2 weeks in Beijing passed quickly with 12-hour days. Yes the Chinese work very hard and have very few holidays; work effort = success. They also take exercise as seriously and are committed to enhancing personal responsibility (healthcare) so that people live long and healthy lives. There are many outdoor gymnasiums in parks for everyone to use, squares for pop up dance groups and tai chi, and walkways with signs that tell you how far in metres you’ve journeyed. This all speaks of nature providing solid ground / instruments that are strong and ready to welcome in the light of soul. 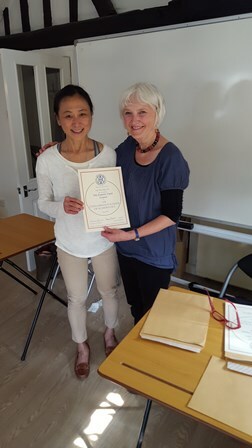 Finally a very big thank you to Han Ting who sailed through the Mandarin interpretation and teaching with speed and efficiency and a very sincere thanks for the gift that Wendy gave us by welcoming in The Connaissance School. 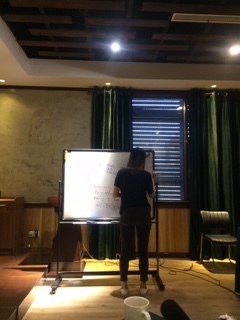 Wendy’s vision is to build a platform that takes Numerology to at least 100 million people in China! Whilst each soul is another drop in the collective pool of light, we have taken the very first steps. Success. 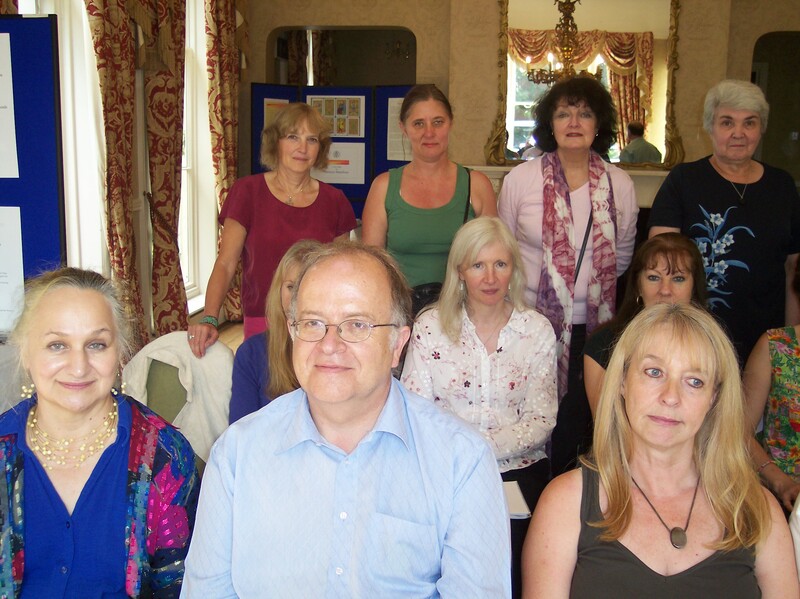 September 2015 Masters Course in Esoteric Numerology Module 1 23rd & 24th September 2015 10am-5pm 8 Melbourn Street Royston. 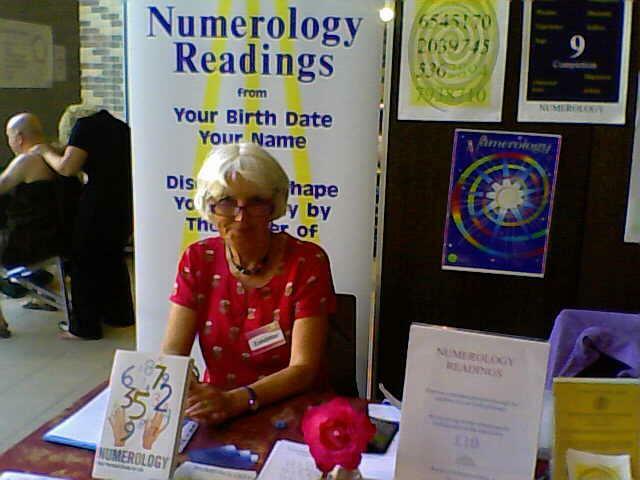 10.00am to 12.30pm - Dream Numerology Workshop Sonia Ducie Dip. CSN. AIN. 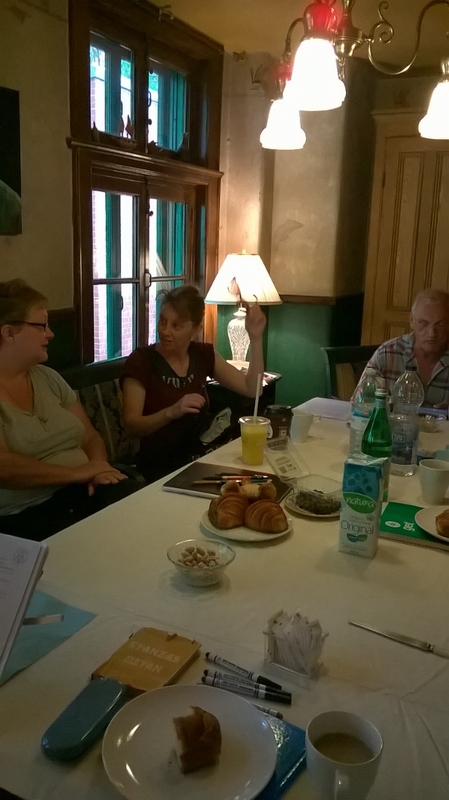 Excellent organisation by Gill and Gaynor. 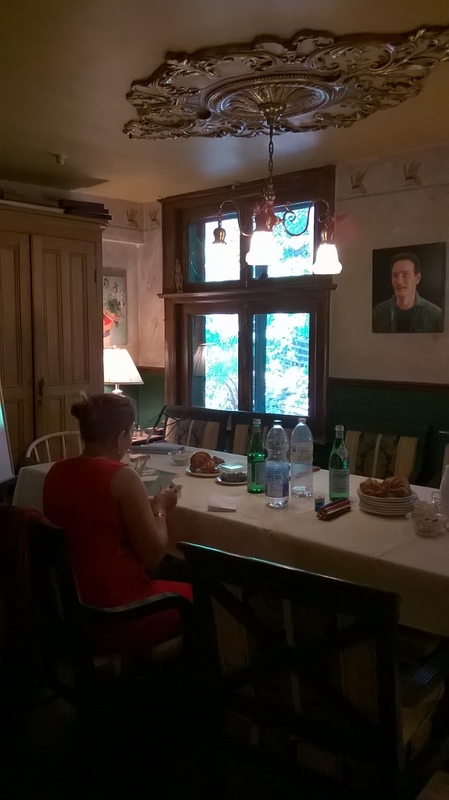 There is a full report and many pictures at the AIN Celebration 2015 tab in the AIN menu. 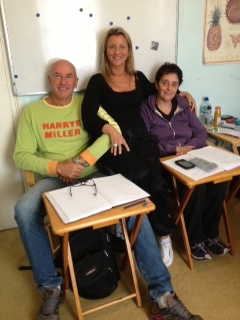 Sonia, Steve and Jacqueline on The Masters Course Module 1, at Royston. July 2015. 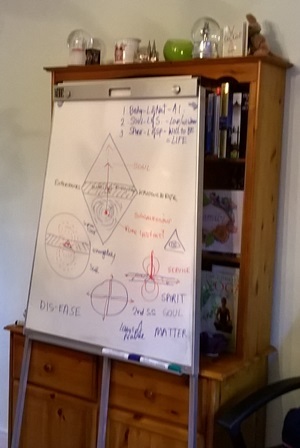 It was an honour to teach this new Course taking the Esoteric Teachings to deeper levels; Simplicity. 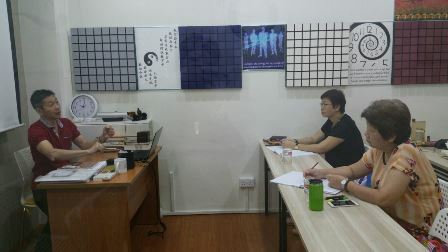 DIPLOMA COURSE in ESOTERIC NUMEROLOGY 25th-30th May 2015 and 1st-6th June 2015 Given in English with simultaneous Chinese interpretation. 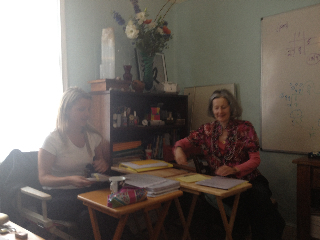 Connaissance School 8 Melbourn Street Royston SG8 7BZ UK Teacher: Sonia Ducie Dip.CSN.AIN. 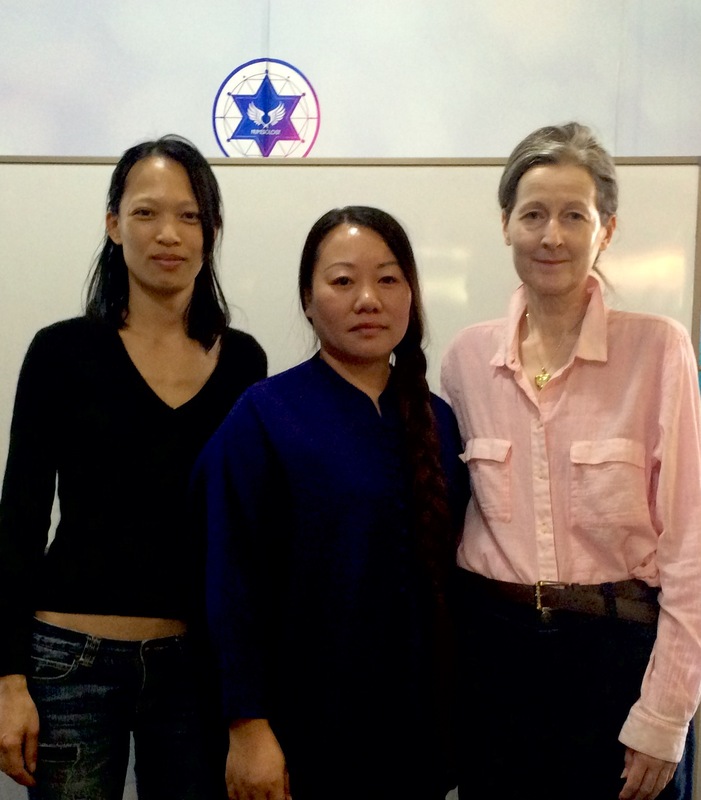 "In May and June 2015 Wendy and Hanting from Beijing embarked upon the Connaissance School Teacher Training Programme with Claudine (Foundation) and Sonia (Diploma) in Royston. 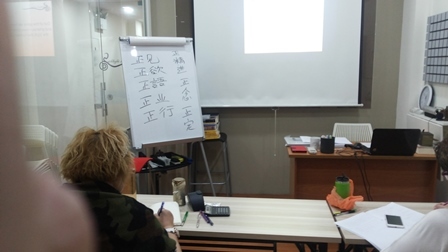 It was exciting to teach with a simultaneous Chinese interpreter. 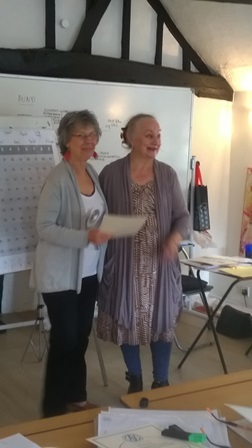 And to forge a union between East and West with Esoteric Numerology"
ESOTERIC TAROT ESSENTIALS COURSE 22 - 28th May 2015 In Singapore Teacher Berenice Benjelloun Dip CSN. AIN. 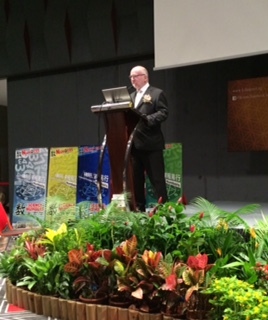 "It was an honour and joy to make the long journey East to give the Connaissance School's first course in Singapore. 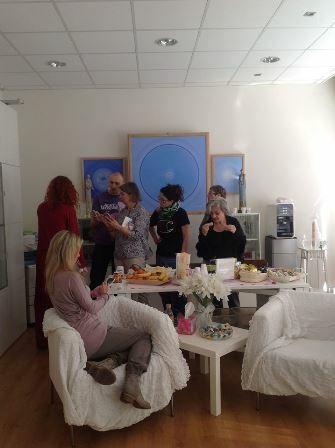 11 AINA members attended, and all of them were doing insightful Soul Tarot readings by the end of the 6 days! 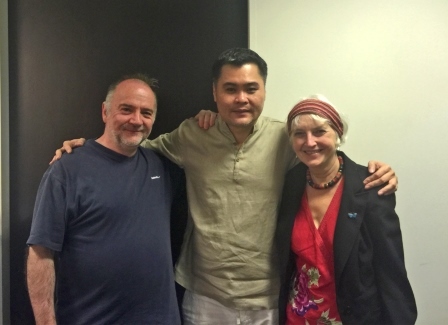 Great thanks to Thomas Chiam for enabling it to happen!" 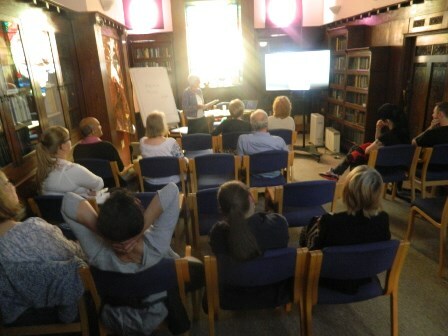 The talk was well attended and everyone enjoyed the evening. 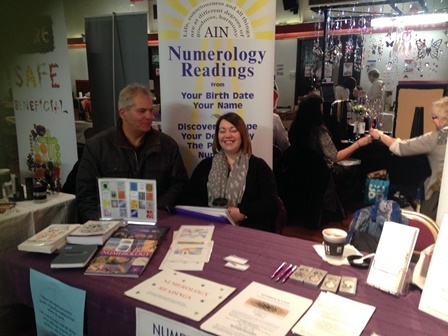 Highlighting the energy around the Cave Shop in Royston and only the esoteric Numerology school in the world! 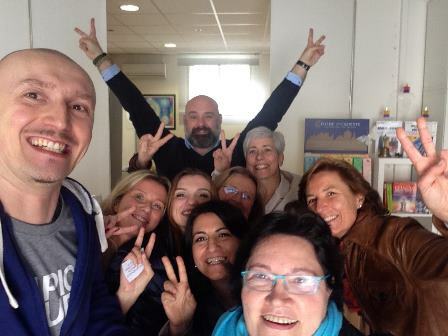 The Connaissance School! The importance of discovering the journey of the soul and who we truly are. Time was given to practical examples around dates of Birth. 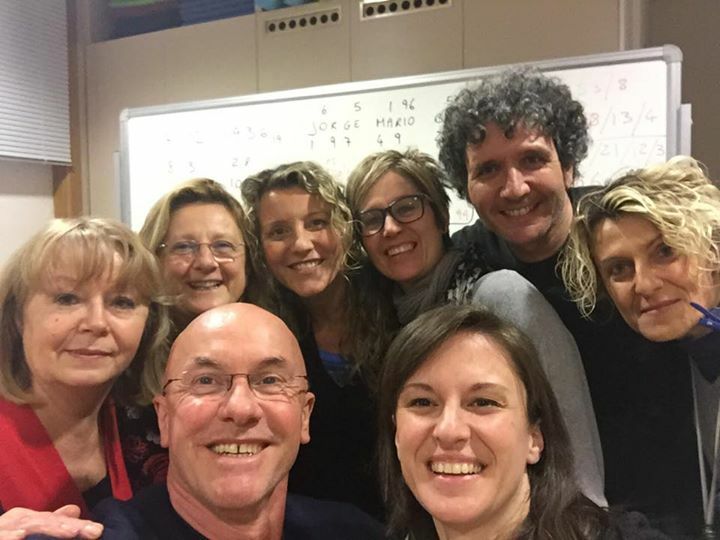 Masters Course Module 1. 17th - 18th May. The Cave Shop. 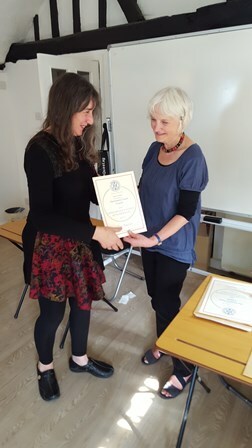 The course was given by Claudine Aegerter. 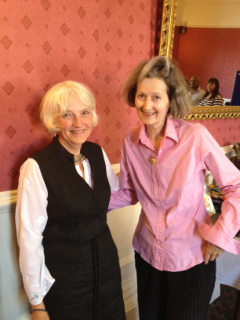 Jacqueline and Christine went to this enjoyable event. We gave readings all day. 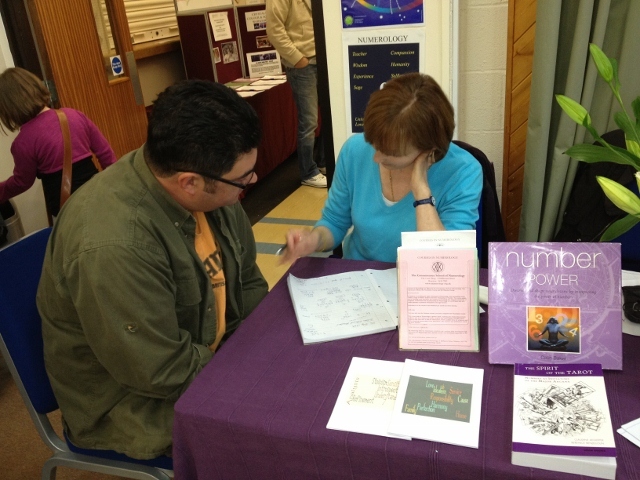 Christine gave a talk on Numerology and a lot of interest was shown in the school by young and old. Picture from Jacqueline. 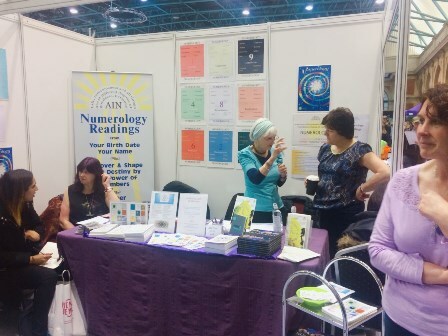 Numerology Readings. 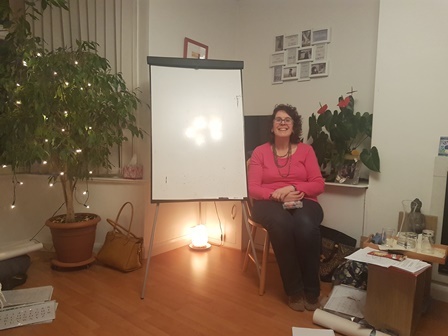 AIN Stand and Star Gazing Within Workshop with Sonia Ducie Dip.CSN.AIN. Saturday 11 April, 2015. 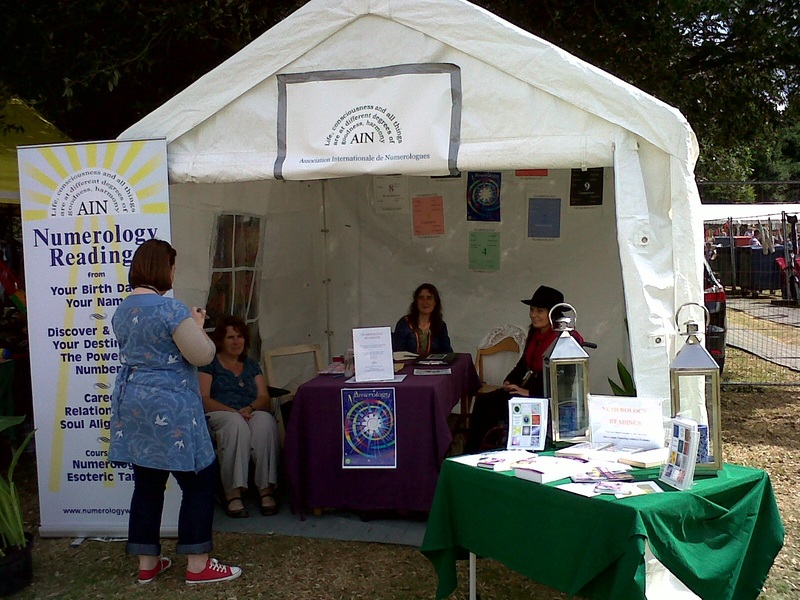 "Yet another uplifting and inspiring Tree of Life Festival at Bournville, Birmingham. 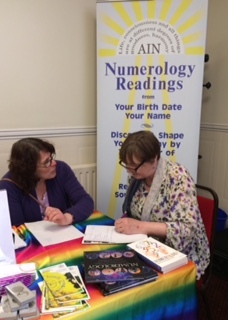 Sonia and Jaye were busy with Readings all day and Sonia gave a Numerology talk for AIN"
It was a joy to welcome 4 new professional Esoteric Numerologists to The Connaissance School and Members of AIN. Congratulations to Nayana, Diane, Ann and Diljeet! 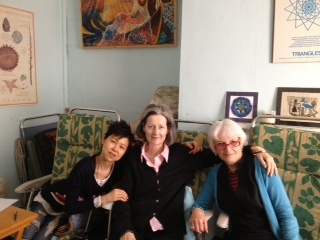 With Sonia Ducie and Gill Kissane. 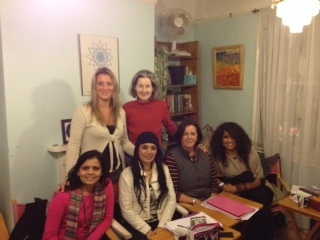 Photos from Sonia: Teacher Sonia Ducie with Ann, Diane, Diljeet, Nayana. 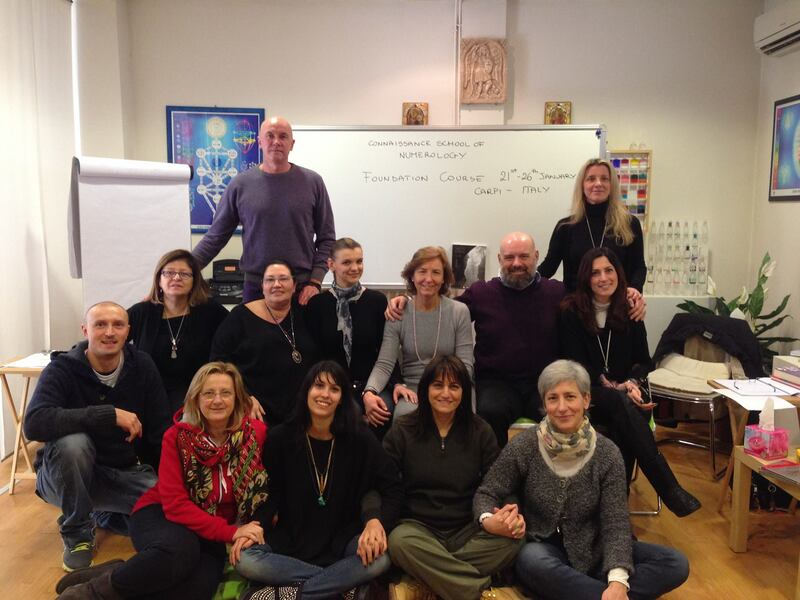 FOUNDATION COURSE in ESOTERIC NUMEROLOGY Intensive 10-15 March 2015 at Carpi (Modena) Italy. 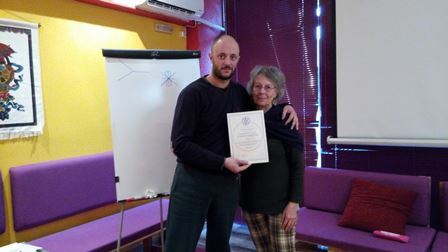 The teachers will be Cristiana Caria and Franco Bertoli. 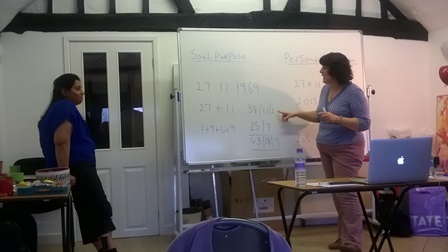 "Sonia gave a Introduction To Numerology Workshop at a traditional Welsh Victorian Church Hall - St Mary s - in Cardiff. 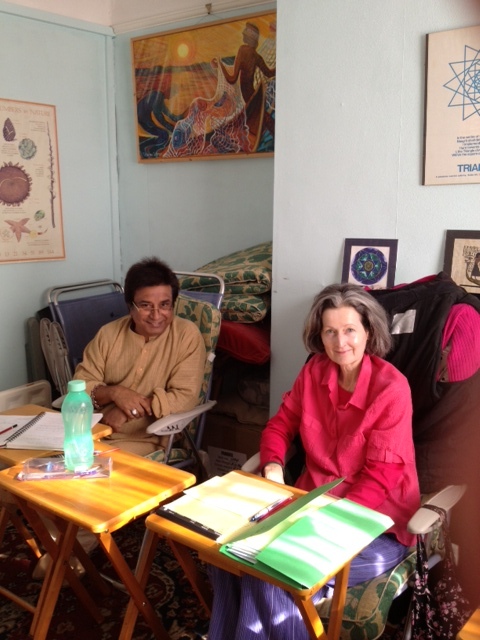 14 students gathered together from the British Society of Dowsers and Cardiff Theosophical Society. It was an inspiring time spent together. 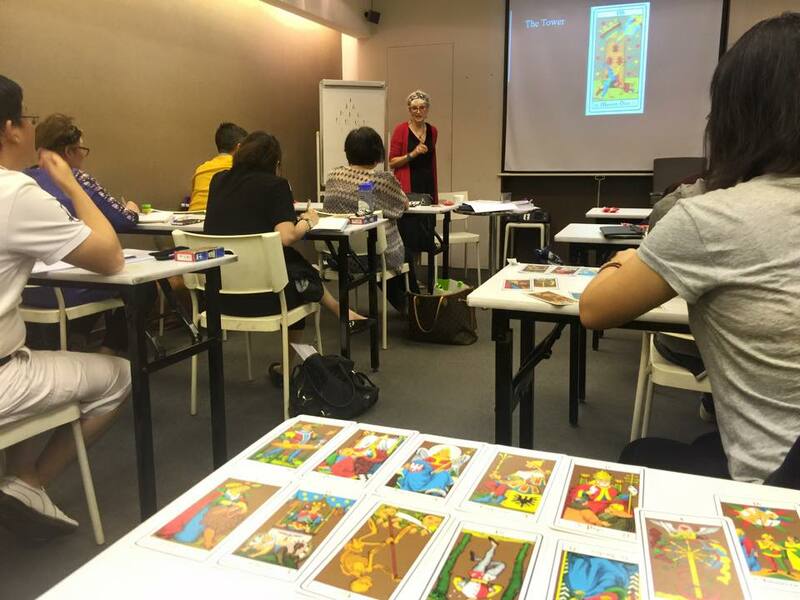 On the two days following the AINA mega event on the 25th January, Thomas arranged for Berenice to give free introductory talks on the Tarot to publicise the Tarot course that will take place in Singapore in May this year. 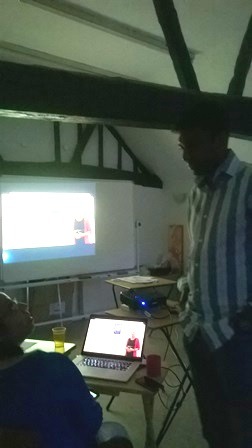 The talks were well attended, 40 people at the first one and 60 at the second. 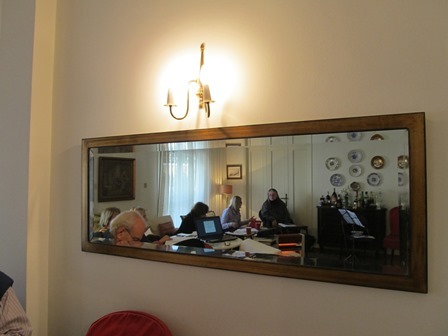 "Between the 12th and 17th of January the second Foundation to take place in the new James 1st room, took place. 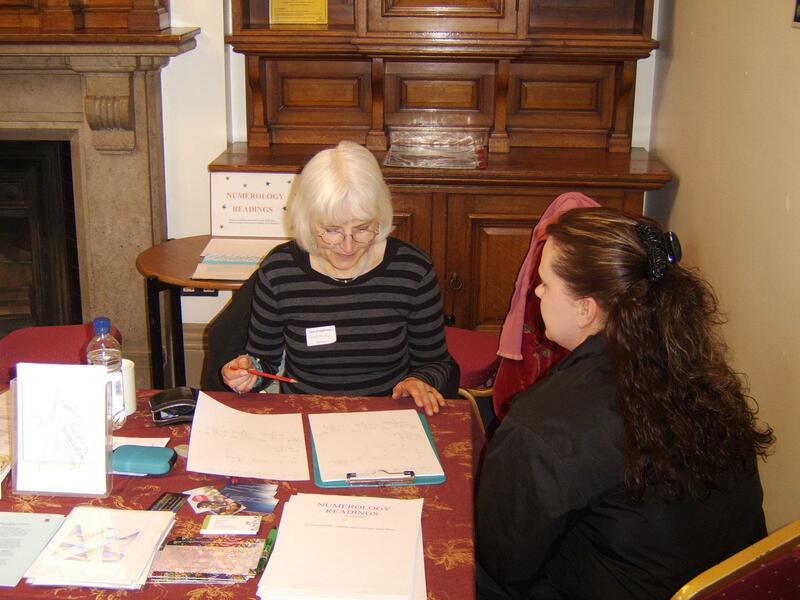 There were 5 attendees- one of whom travelled from Greece to take part." 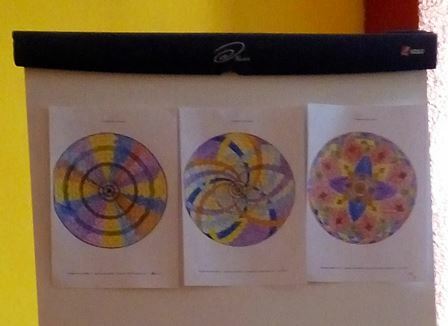 Numerology Conference Milano Galleria Unione 7th December 17.30 - 19.00 with Cristiana Caria and Franco Bertoli. 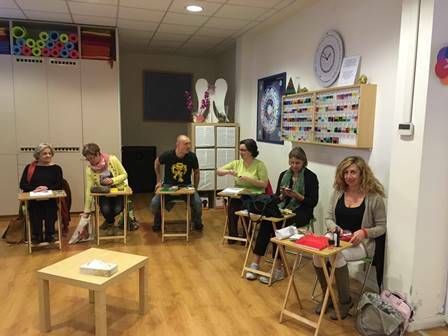 Report from Cristiana Caria: It was a great success - 100 people attended and we have received lots of enquiries for courses. We are thinking of running another in a few months. 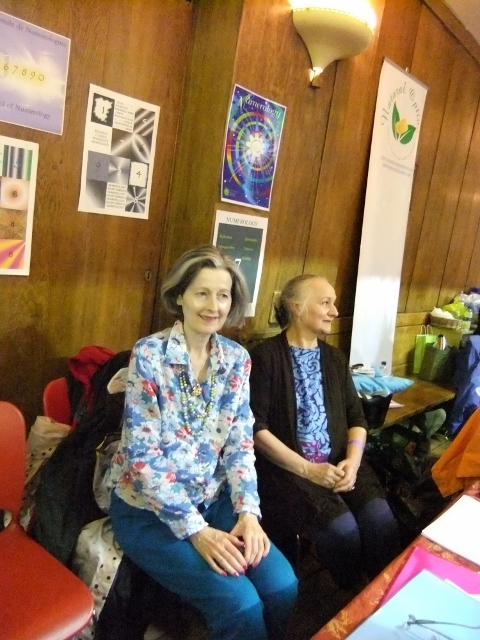 Christine, Margarita and Berenice ran a stall for AIN at the yearly King's Langley Rudolf Steiner School Advent fair, held on 29th November. 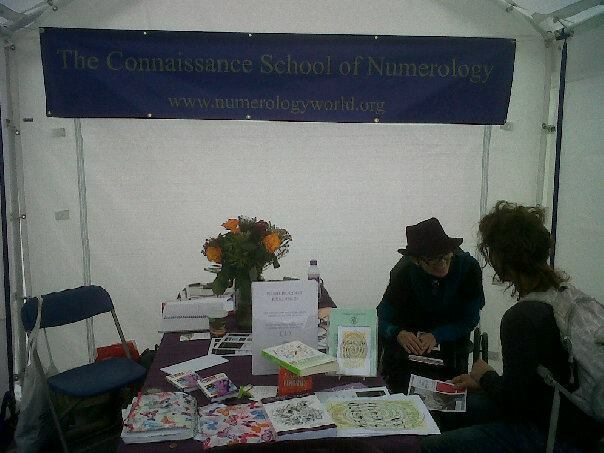 We did a number of readings and there was a lot of interest in the Connaissance School. 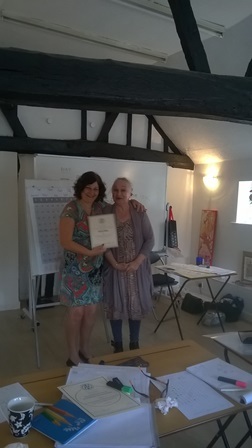 Sonia Ducie Dip.CSN.AIN gave a Foundation Course in Esoteric Numerology 17-22 November 2014 in the new James 1 Room at The Connaissance School, Royston. 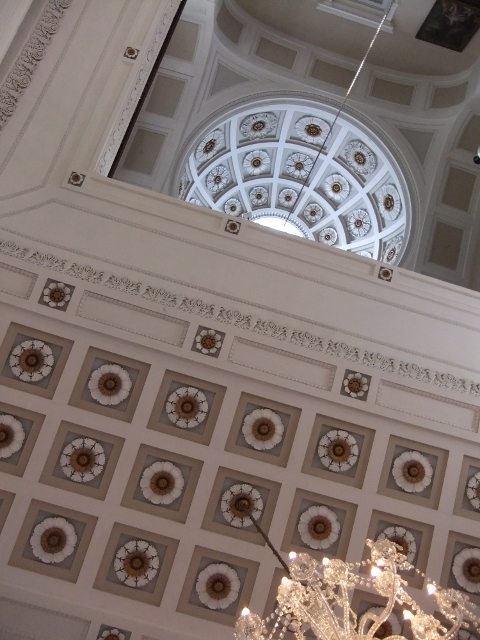 It was the first group to have the privilege of working in the clear and uplifting space, built c1500 and recently updated. 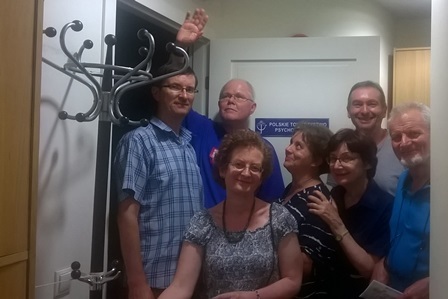 There are now 3 teaching rooms with new loos and kitchen - real expansion at The School HQ. 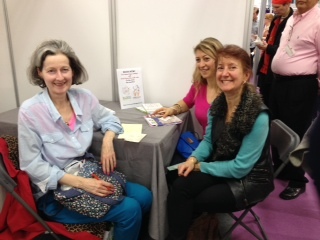 Another busy day of Readings on the AIN stand at Hels Belles Vintage Fayre with Sonia and Berenice. 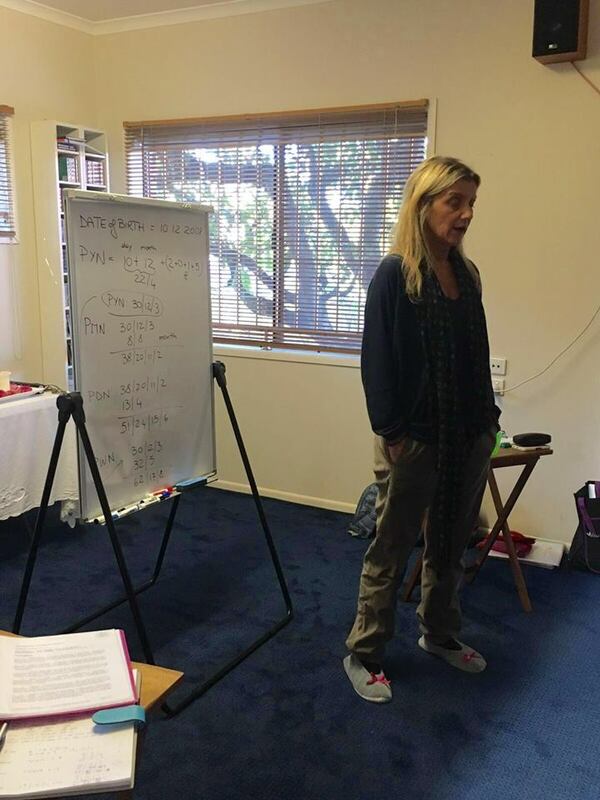 Sonia gave a Numerology Workshop at Wynstones Steiner School on 26th October, and it was an inspiring day. 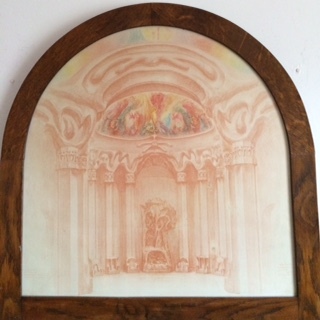 Pictures of Joan of Arc, and the Goetheanum (HQ) sculpting by Rudolph Steiner. 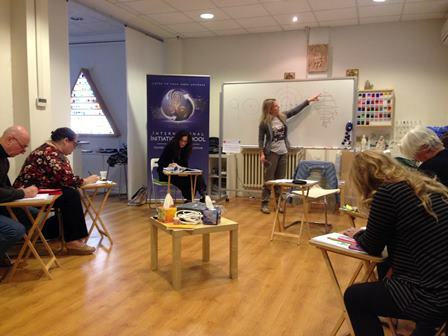 FOUNDATION COURSE in ESOTERIC NUMEROLOGY Intensive 16-21 October 2014 at Carpi (modena) Italy. 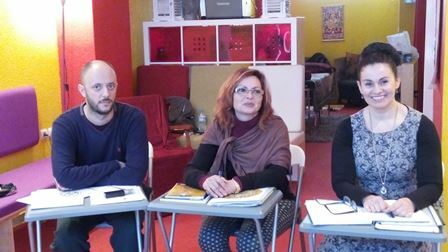 The teachers will be Cristiana Caria and Franco Bertoli. AIN and The Connaissance School celebrate a birthday - 21 years old - at the AGM. 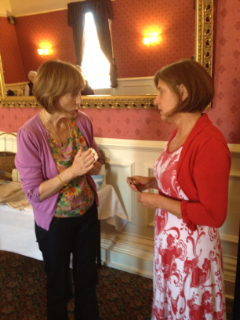 There was a raffle, business matters, and Claudine gave an inspiring Talk. 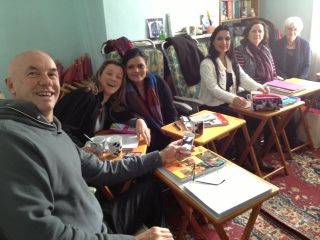 everyone enjoyed Gill and Berenice s Birthday Cake ! 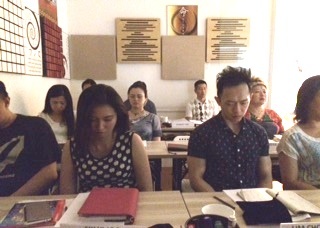 FOUNDATION COURSE in ESOTERIC NUMEROLOGY Saturday 23rd - 28th August 2014, in Melaka, Malaysia. 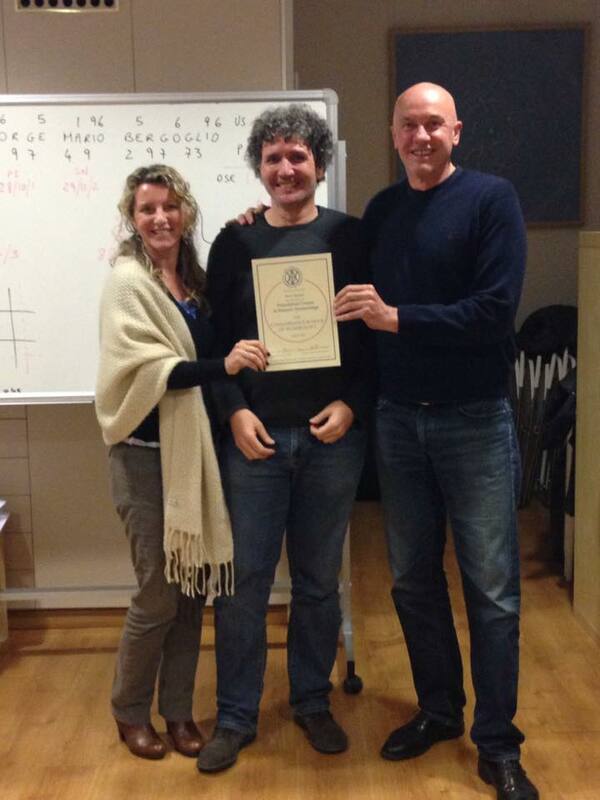 The teachers were Cristiana Caria and Franco Bertoli. 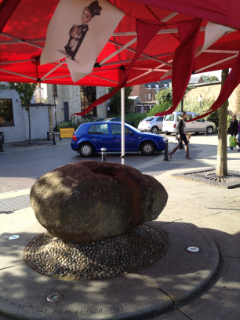 We attended the Rhythms of the World music festival in Hitchin last Saturday and Sunday. 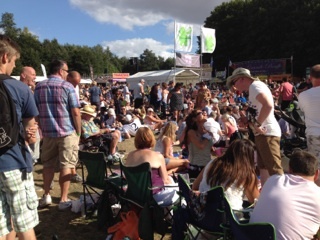 Great music on both days, carnival atmosphere and very hot with only one major downpour. The stand was busy both days and the event very well run, lots of volunteers helping and on the last day all the rubbish collectors walked triumphantly up the main road to applause! 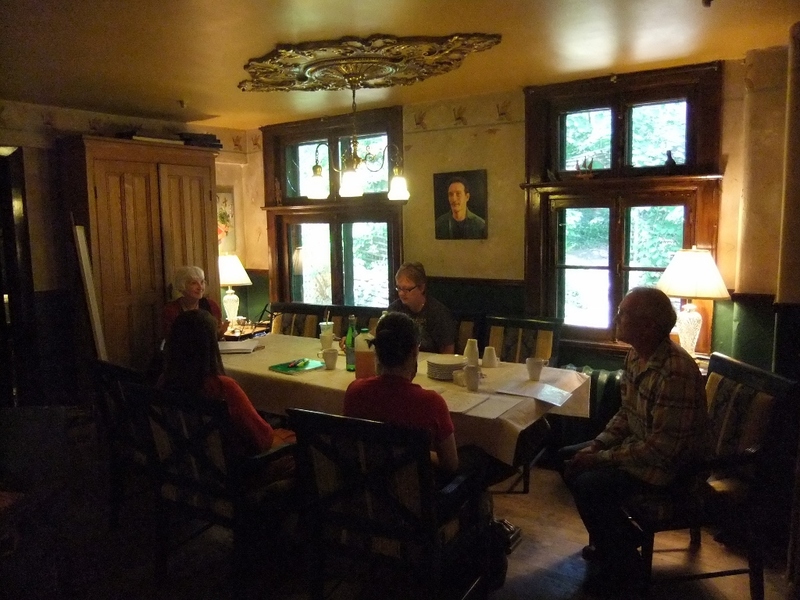 A new spark of the light of the School was ignited in the Canada this summer, in the city of Montreal in Quebec. 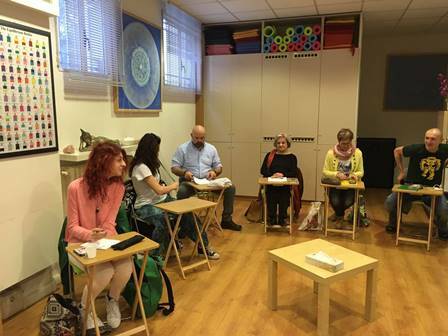 A group of students, some of whom had already passed through the School, gathered together to partake in the Foundation course. 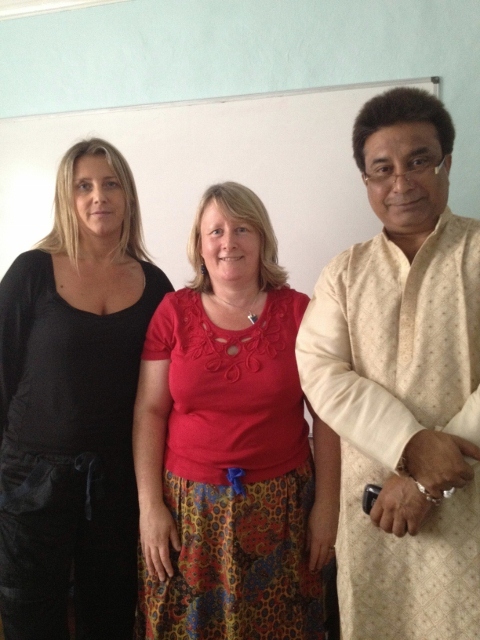 The teacher was Berenice Benjelloun. 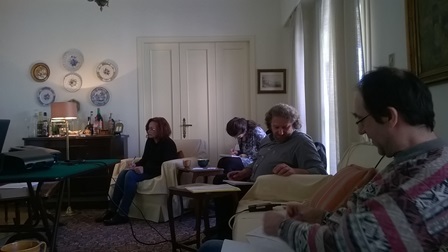 The course took place in the home of one of the participants, James Simon. 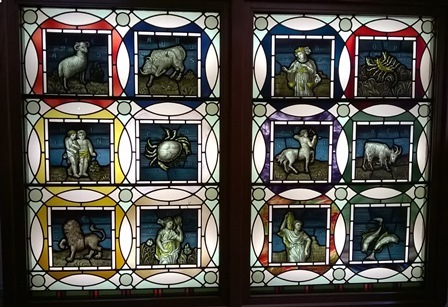 He is an artist who lives in one of the few old buildings in the grounds of the McGill university, situated at the foot of the mound of Montreal. The house nestles in the in the shadows of the vast glass edifice of the medical faculty of the university. 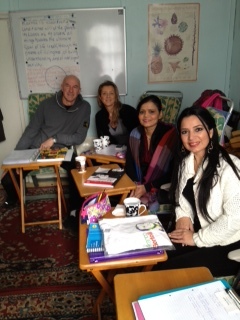 As always, the Foundation course was a powerful inspirer and the group were keen to continue contact and learning. 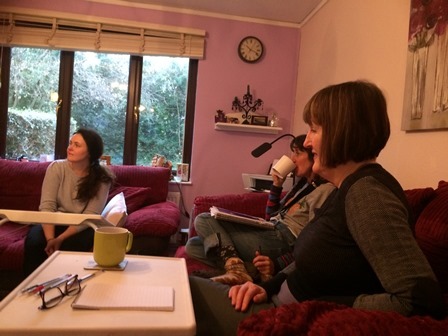 Those who had already done the Diploma Course are thinking of getting some talks and workshops together to stimulate further interest in a second Foundation course which can take place early next year. 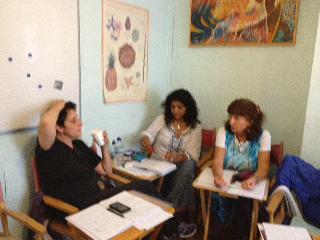 FOUNDATION COURSE IN ESOTERIC NUMEROLOGY One week intensive. 18th - 23rd July, 2014. 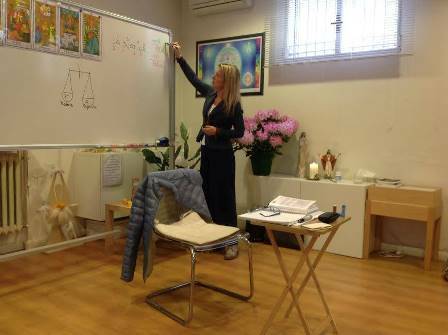 The teacher will be Cristiana Caria. To be held at Taipei, Taiwan. Stand E3 / B26 Earls Court Exhibition Centre Warwick Road. London SW5. 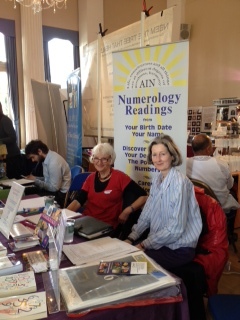 Sonia gave an abundance of Numerology Readings at the Mind Body Spirit Festival, Earls Court in May. 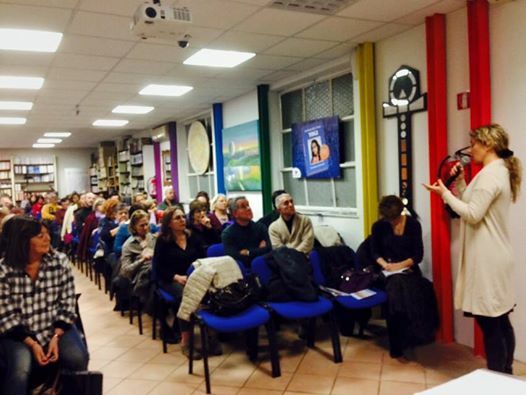 As usual everyone wanted to learn more about the subject, the Connaissance School and about Sonia s books. It was an expansive event all around. 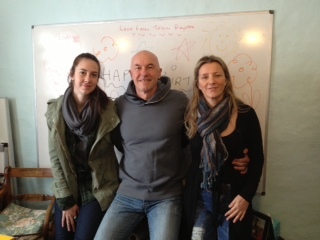 Thanks to Vicky and Francesca at Watkins. 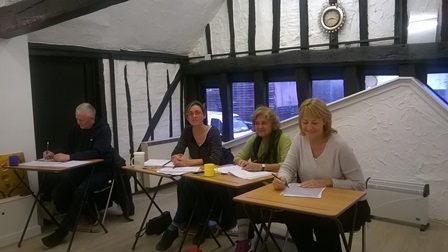 Gill and Alison Teacher Training, with Gaynor, Janice, Lizzie and Sam. 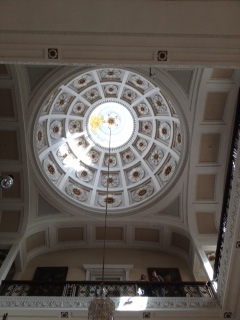 The sun shone inside and out - a wonderful week. 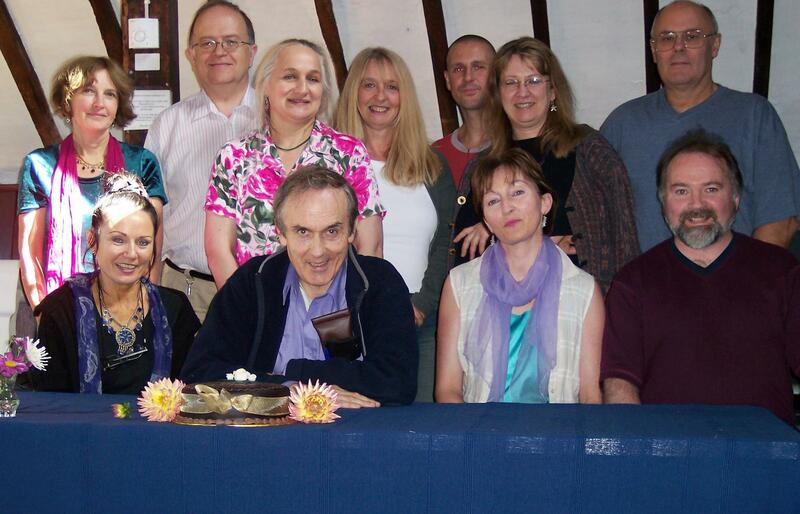 FOUNDATION COURSE in ESOTERIC NUMEROLOGY 26-31 March 2014. Carpi (Modena), Italy. 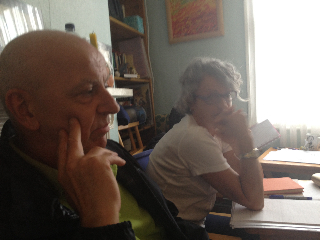 The teachers are Cristiana Caria and Franco Bertoli. 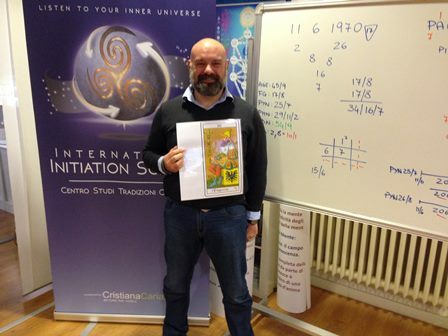 FOUNDATION COURSE in ESOTERIC NUMEROLOGY 16-21 February 2014. Carpi (Modena), Italy. 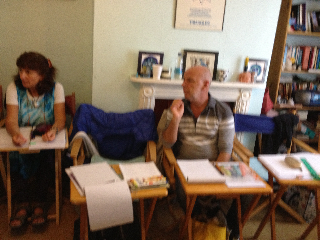 The teacher is Cristiana Caria and Franco Bertoli. 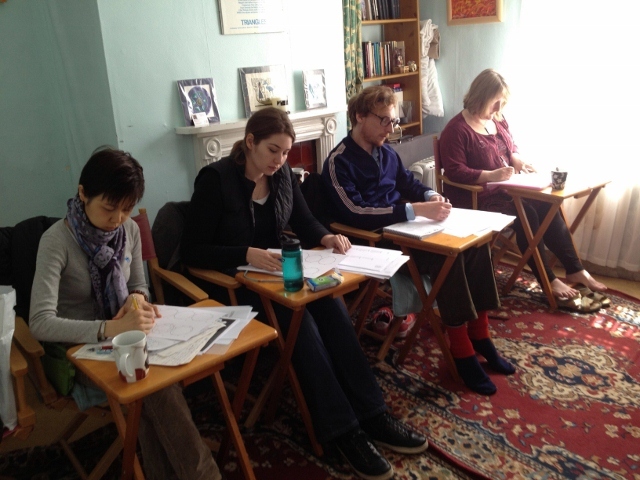 DIPLOMA COURSE IN ESOTERIC NUMEROLOGY. Two weeks intensive. The teacher was Sonia Ducie Dip.CSN.AIN. 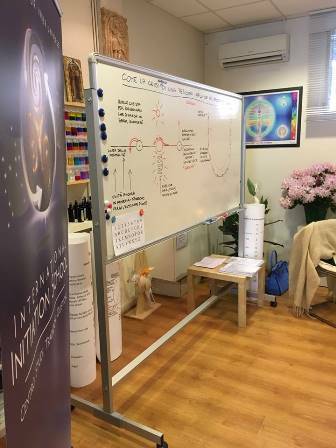 FOUNDATION COURSE IN ESOTERIC NUMEROLOGY One week intensive 13th - 18th January 2014 The Cave Shop, 8 Melbourn St, Royston, Herts SG8 7BZ. 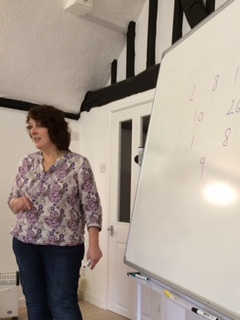 INTRODUCTION TO NUMEROLOGY TALK With Sonia Ducie Dip.CSN.AIN. Friday 27th September, 2013. 6.30pm-7.30pm. 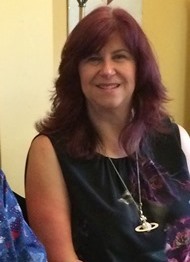 August 2013. 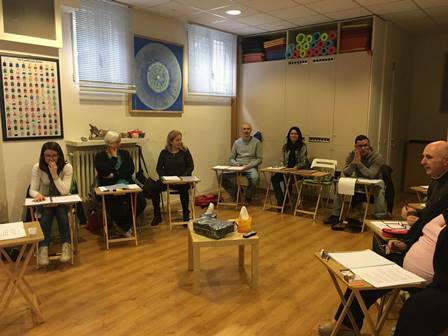 CSN hosted a Foundation Course in Royston with Sonia Ducie - translated into Italian by trainee teacher Cristiana Caria. 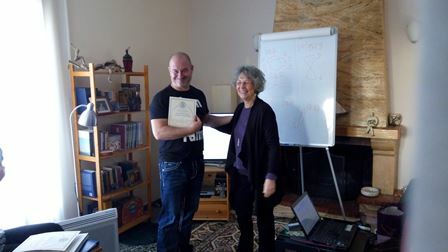 It was an inspiring course as usual and a wonderful week! Flitwick, MK45 1AH. 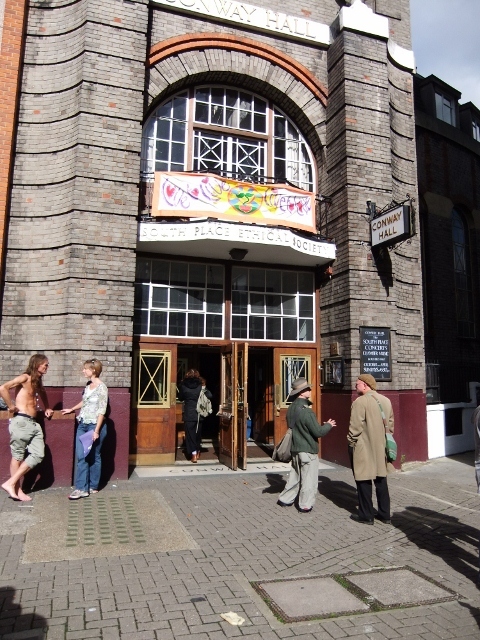 Doors open 10am, close 5pm. 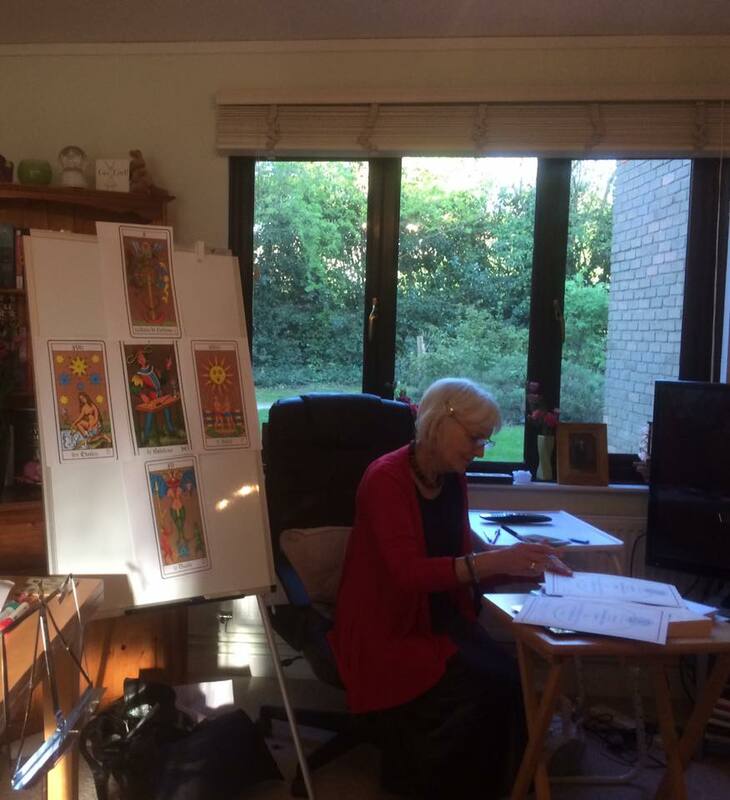 NUMEROLOGY CHART READING DAY. 9th March 2013, at The Cave Shop, 8 Melbourn Street, Royston, SG8 7BZ. 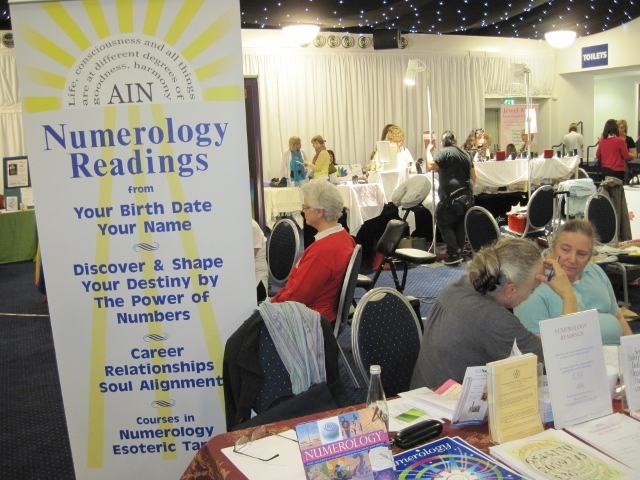 Numerology Readings: Ladies Pamper evening at Welwyn Rugby Club Hobbs Way, Welwyn Garden City, AL8 6HX. On the 8th March 2013- starts 7pm. Tickets £7.00 to include glass of wine/soft drink, nibbles and raffle ticket. 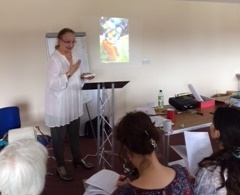 UNITY, POWER AND SUCCESS Lecture with Sonia Ducie Dip.CSN.AIN. 18th January 2013. Kreta Ayer Theatre. 30A Kreta Ayer Rd. Singapore. 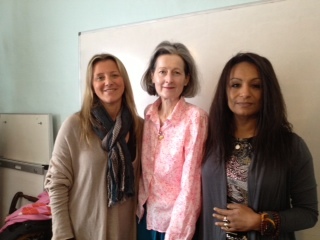 "Sonia gave a Numerology Business Course at Royston with CSN post graduates Gill, Jane and Jax. 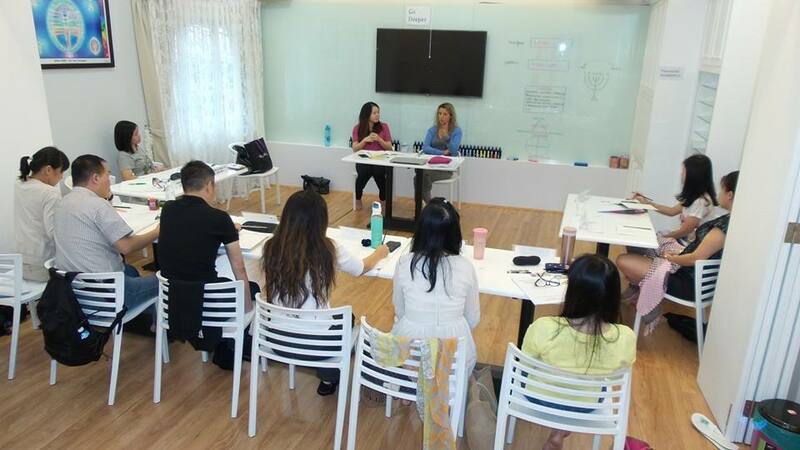 It was an inspiring and insightful 3 days, with the students presenting professional business profiles to the group." 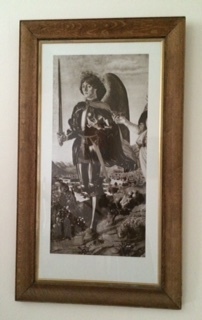 was gratefully translated from English to Italian by Cristiana in a sleek and fluent way. It was a powerful and educational weekend. 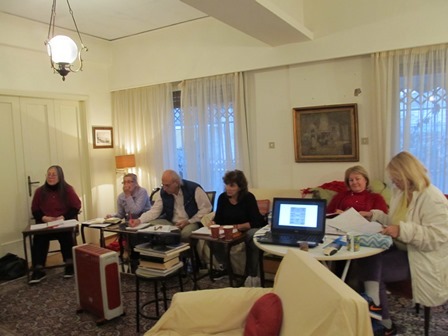 The Italian group are looking forward to returning to Royston for The Foundation Course in Italian / English in April." 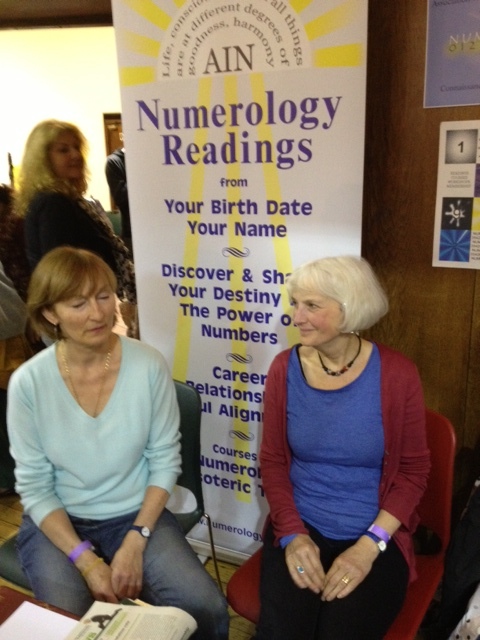 "Sonia and Berenice gave Numerology Readings at this vibrant and busy well established Fayre." 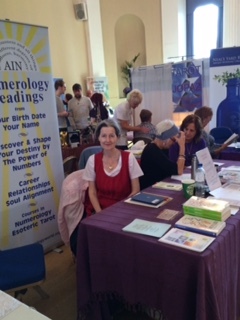 "AIN took part in the Mind body and Spirit fair at Saffron Walden on Sunday the 14th October. 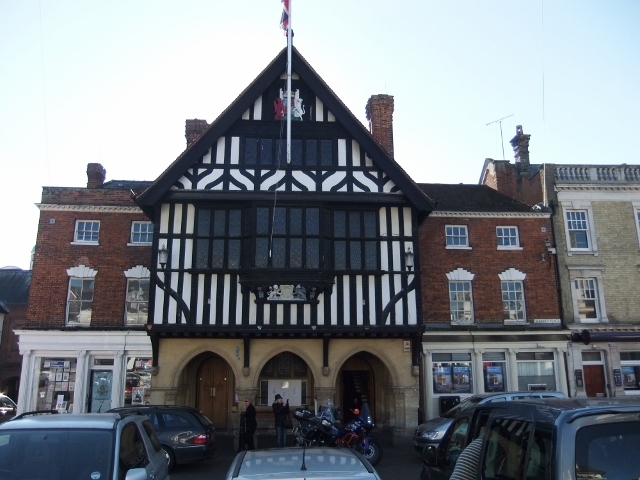 Our member Shirley Golding, was instrumental in organising the fair, which took place in the lovely, picturesque venue of the Town Hall. 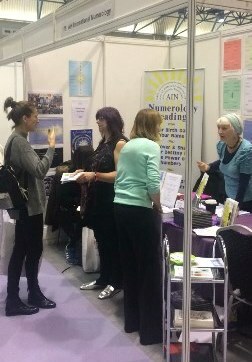 Shirley gave a talk on Numerology while Margaret and Berenice did readings on the AIN stand. 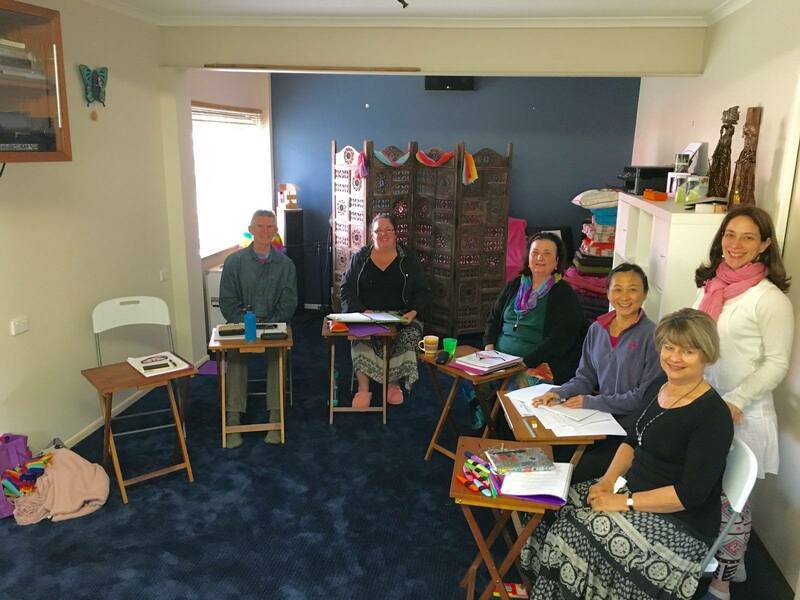 It was a huge success - 15 readings were done during the day and there was a great interest in the School; resulting in one of the recipients of a reading joining the Foundation Course the next day." 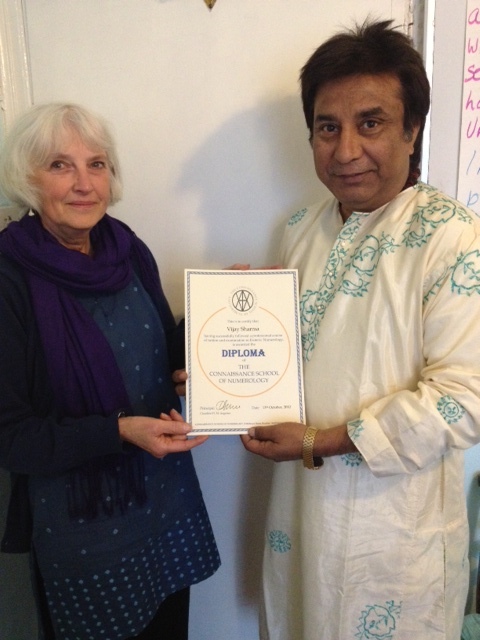 Berenice presenting a Diploma Certificate to Vijay Sharma from India, in Royston on 13th October. 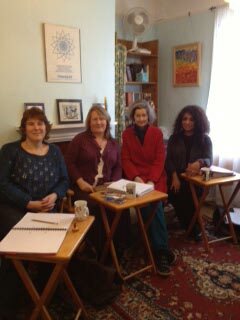 Claudine also taught the 2 week Intensive Course, joined by Sonia, Sophia and Jenny. 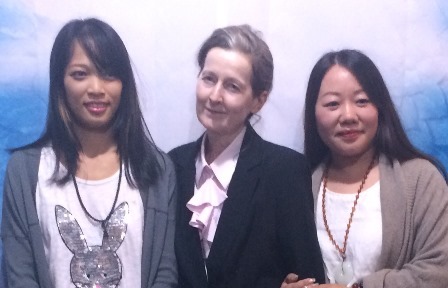 Another inspiring and transformative journey, this time bringing together East and West. 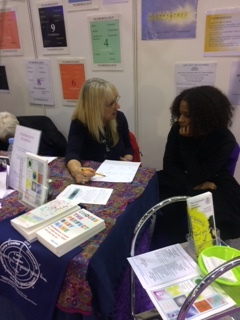 "Sonia Ducie book signed and gave Numerology Readings at the Mind, Body, Soul Show at Olympia. 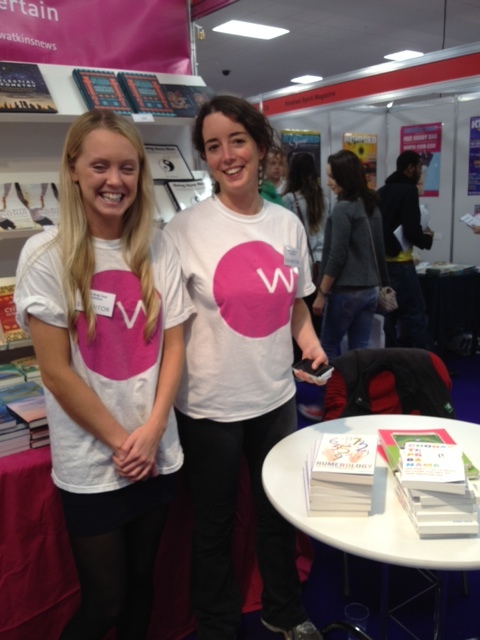 Big thank you to Francesca and her team at DBP / Watkins Publishing." 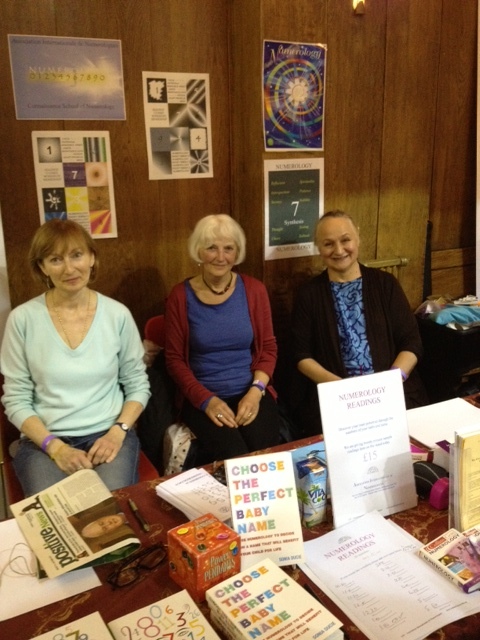 "The Festival of Life on the 29th September in Conway Hall, London was certainly full of life! 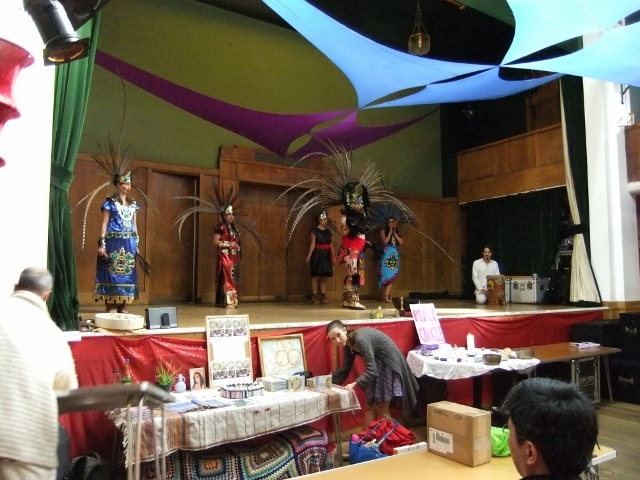 It was a very colourful and exciting event, with dancing, music and food. 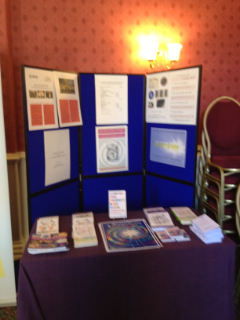 Our AIN table was well received. 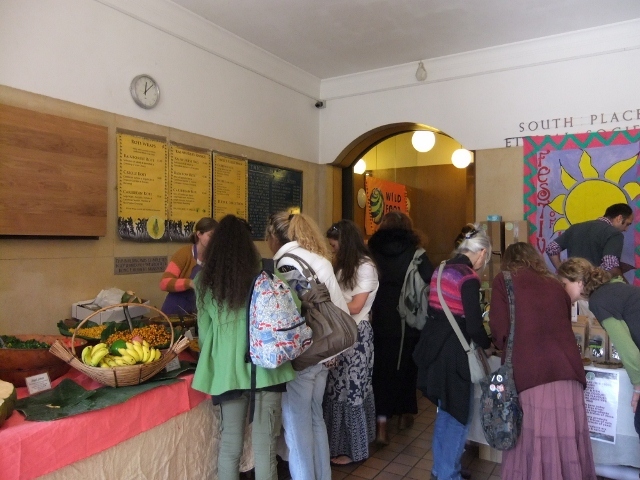 Claudine, Berenice, Margarita and Sonia all helped; we did 6 readings and sold some books, as well as talking a lot about the school to those interested." 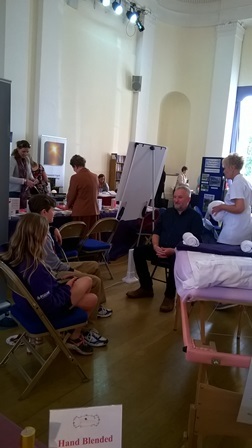 "The recent Reiki sound event, was held in the wonderful Spirella ballroom at Letchworth Garden City, only 20 minutes away from Royston. Built in 1911 and full of history and art deco feel, the site used to be the headquarters of the world renowned Spirella corset company. 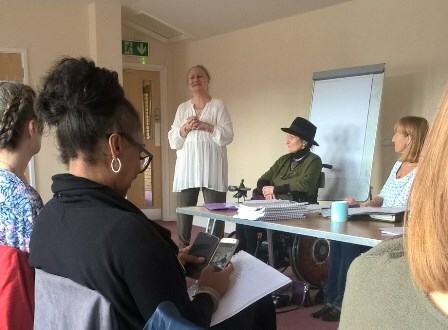 I reflected that in the 19th and 20th centuries the female energy was restricted by the corset while in the 21st century at this event, the female energy could flow freely. 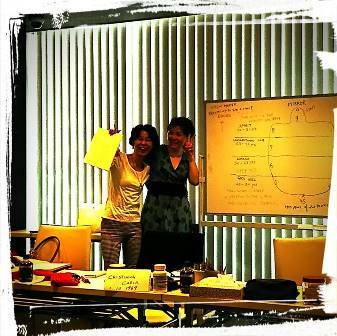 Talks were given by Christine and Berenice on the stage. 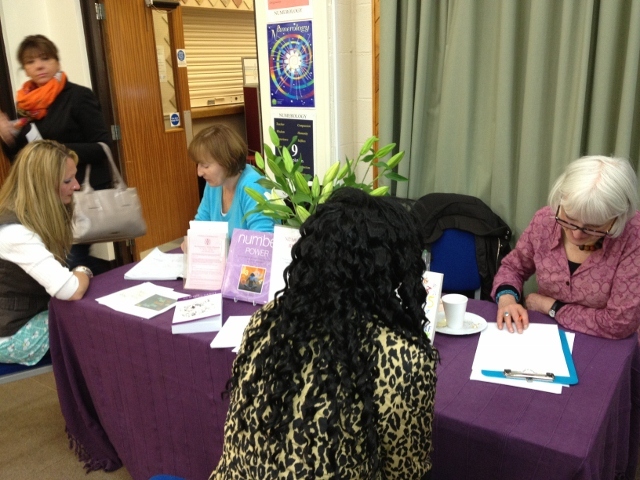 12 readings were given and some books were sold. A most interesting day." 15th September 2012. 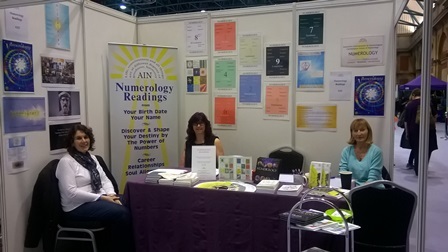 Annual General Meeting of the Association Internationale de Numerologues. Report and photos to follow. 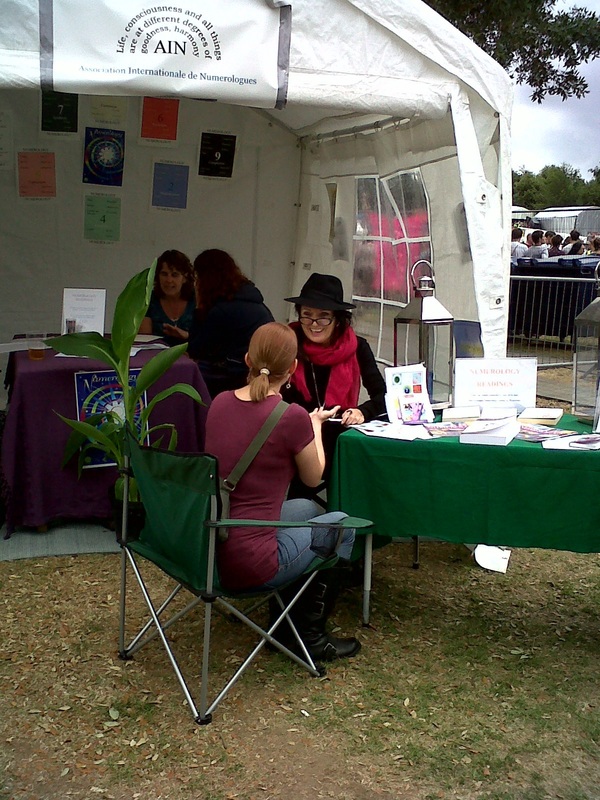 The Harlow Health and Healing Festival. Harlow College, Velizy Avenue, Harlow, CM20 3LH, 8 - 9 September, 2012. 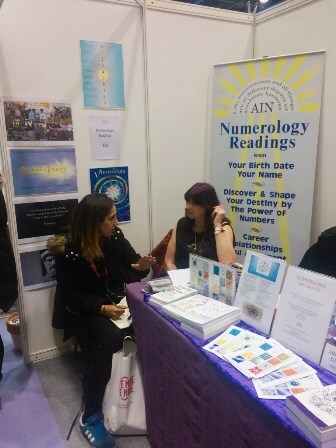 "The members of the public who came to AIN's stand at Harlow College were very appreciative of the Numerology readings given by Tina, Berenice and Margarita. 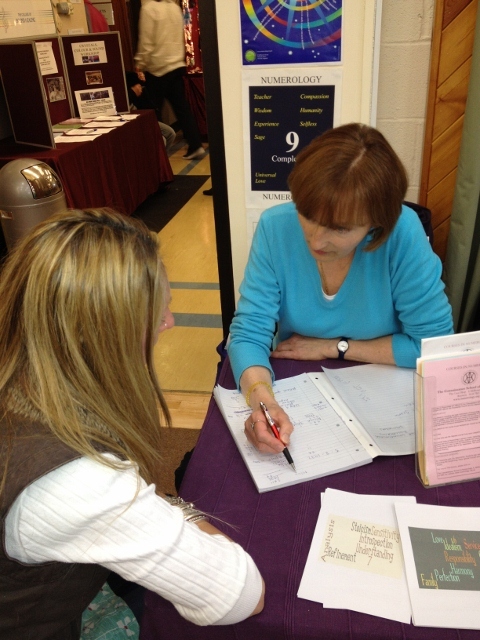 14 readings were given over the two days, many school brochures were given out and 2 books sold. A successful weekend." 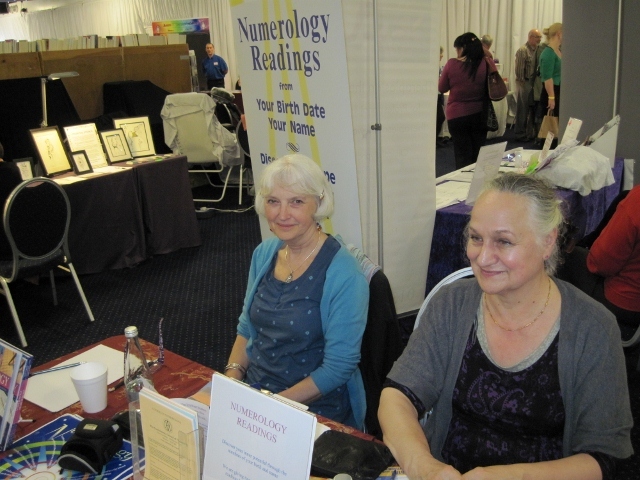 "Berenice and Sonia gave Numerology Readings at this Fair. 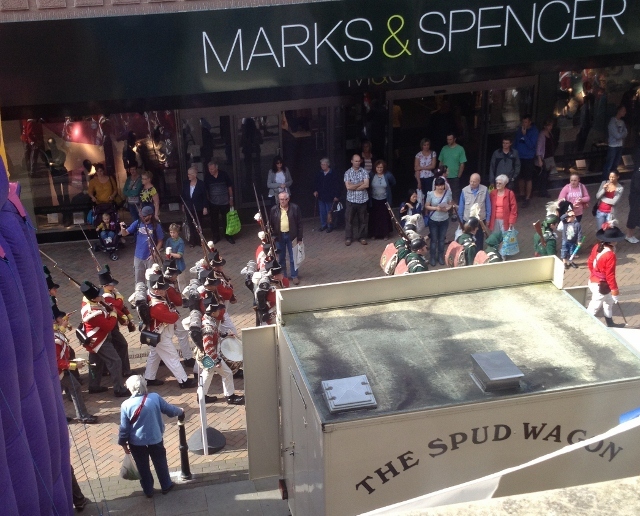 Outside, there was a parade of soldiers which added to the atmosphere of this ancient City." 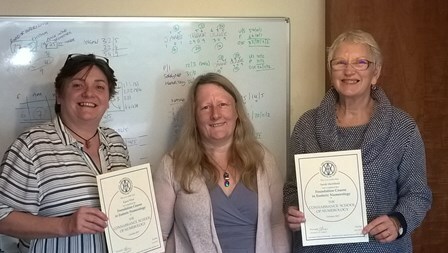 FOUNDATION COURSE IN ESOTERIC NUMEROLOGY (CPD)(Certificated). With Sonia Ducie Dip.CSN.AIN. 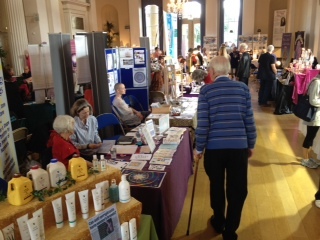 Leeds Health and Healing Festival. 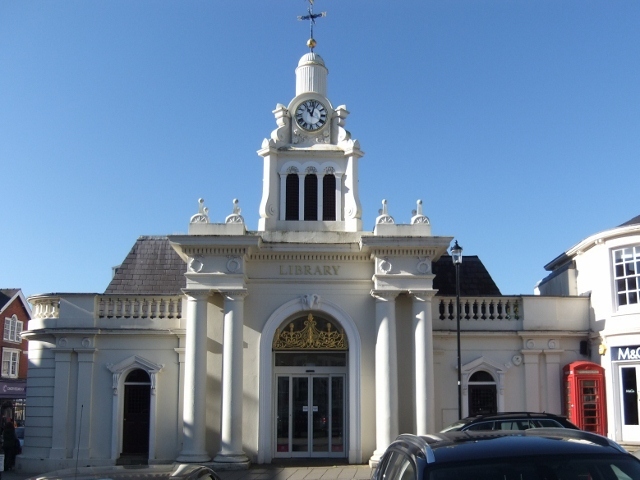 The Centenary Pavilion. Leeds United Football Club. 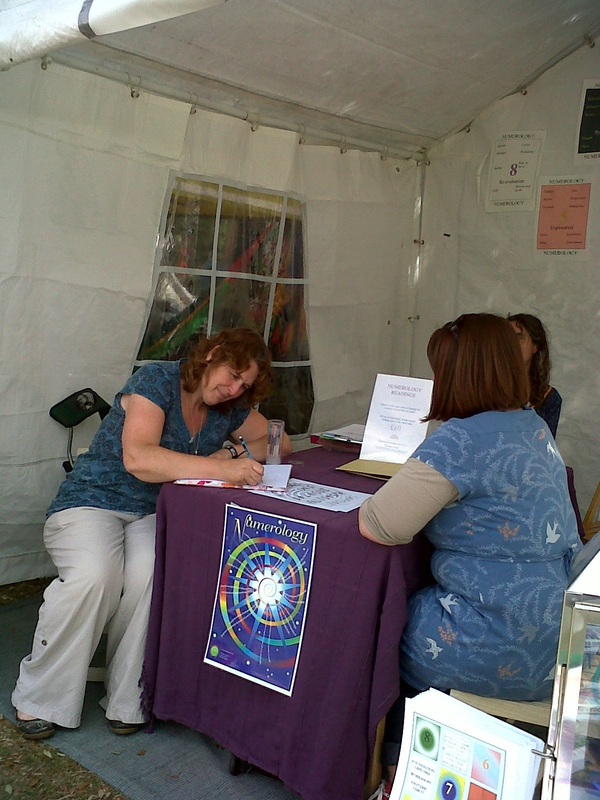 Elland Road Leeds LS11 0ES 7th - 8th July, 2012. www.healthhealingfestivals.co.uk. Here is Berenice Benjelloun's report. 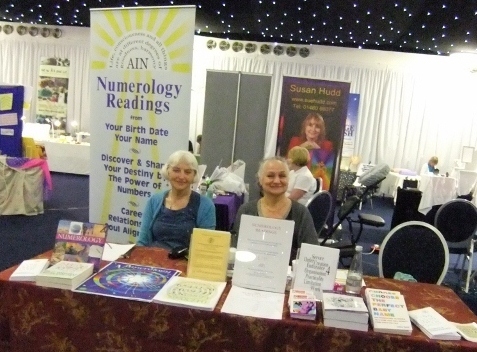 "AIN had an extremely successful weekend at the Festival of Health and healing which took place in Leeds on the 7th and 8th July. 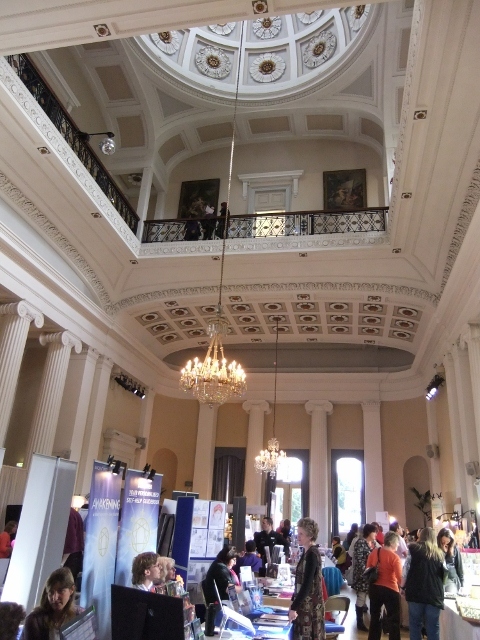 It was a well organised event set in a lovely venue. 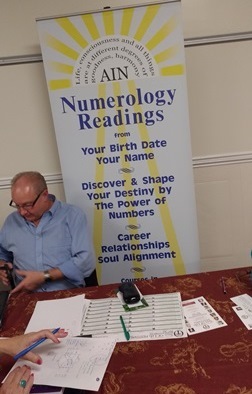 33 people came to our stand for readings over the two days, and many others attended the talk on Numerology given by our AIN member from Leeds, Paul Barker. 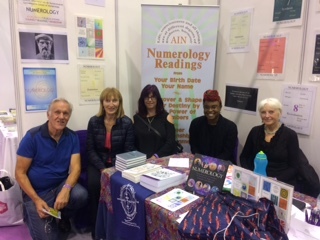 Our members who manned the stand and gave the readings were Claudine Aegerter, Berenice Benjelloun, Gill Kissane and Paul Barker. An inspiring and uplifting day for all!" 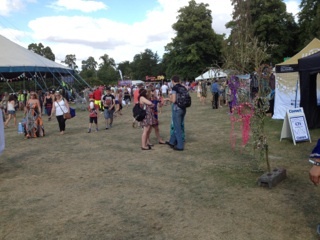 "AIN was at the 20th anniversary of the London Green Fair at Regents Park, exploring the green heart of London. 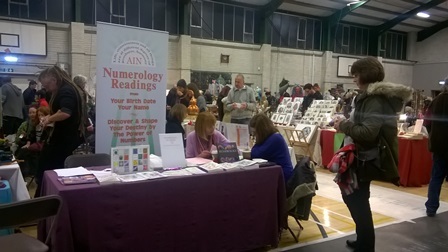 We gave readings and information about Numerology and the Connaissance School to the hundreds of people visiting the numerous stands. Sustainable living, permaculture, all things green and a fantastic range of musicians, were all part of the scene over the weekend of 9th- 10th June. 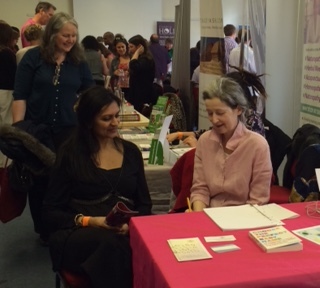 Our members who manned the stand and gave the readings were Sapna Mohan, Margarita Coleman and Gill Kissane." 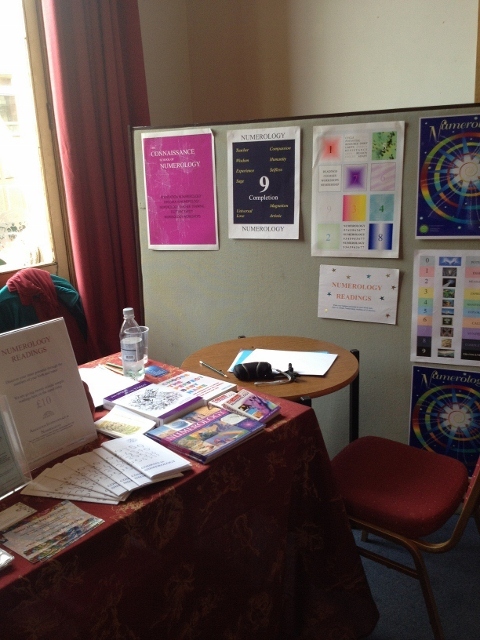 "AIN was represented at the 'Dawn of Enlightenment' fair, which took place in the Guildhall, Gloucester. 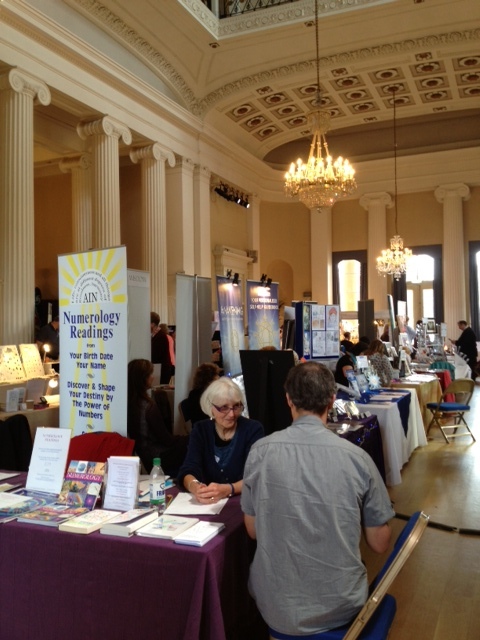 It was a great venue and we had a very positive day giving many well-received readings. We are looking forward to taking part in their next fair which is taking place on September 1st. 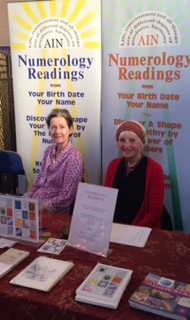 Our members who manned the stand and gave the readings were Sonia Ducie and Berenice Benjelloun"
"We again enjoyed our visit to the Health and Healing fair held at York Racecourse - there was lots of space and light. 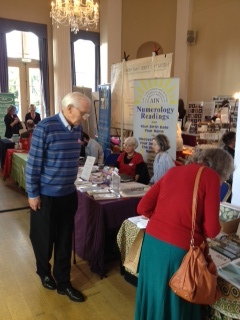 It was well organised and all the other stall holders were very friendly. 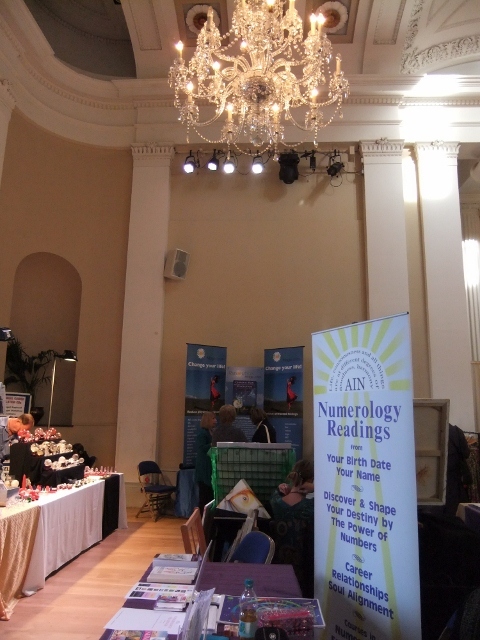 It was well attended, and the two AIN members gave readings right through both days. 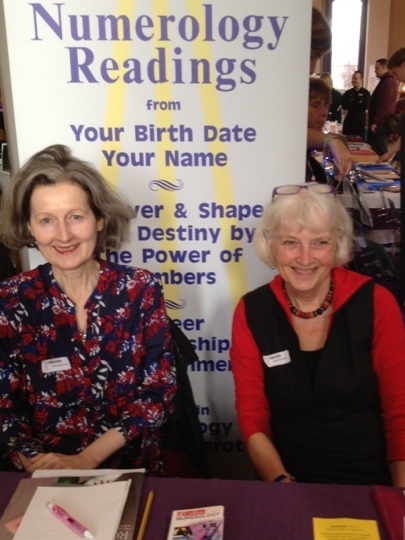 Our members who manned the stand and gave the readings were Claudine Aegerter and Berenice Benjelloun." 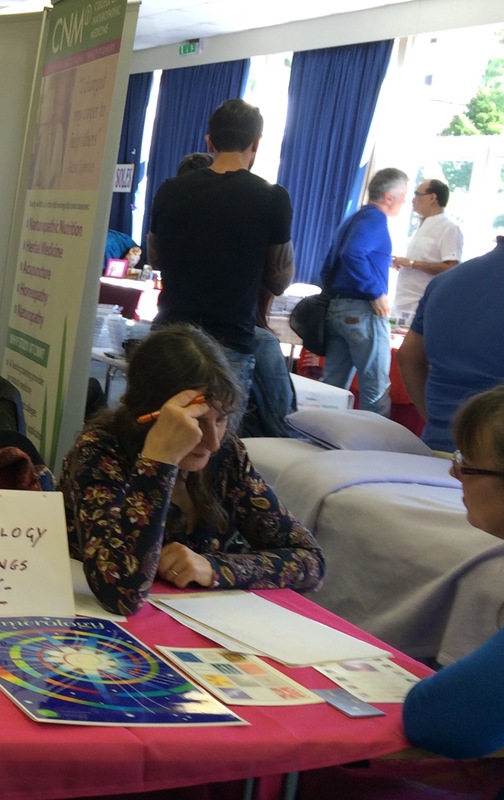 "AIN members took part in our visit to the fair organised by Reiki sounds at Flitwick, Bedfordshire which we have attended annually for many years. 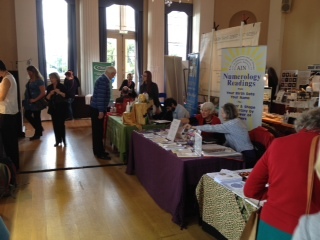 A busy weekend giving readings and enjoying the atmosphere of the venue. 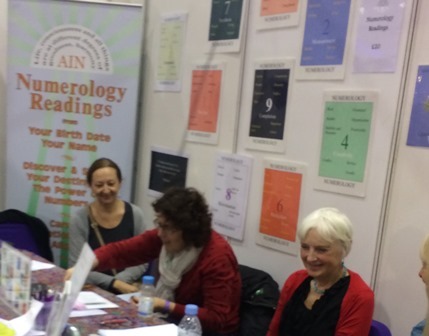 Our members who manned the stand and gave the readings wereChristine Tonks, Tina Haynes, Arthur Tomlinson, Margarita Coleman and Berenice Benjelloun."